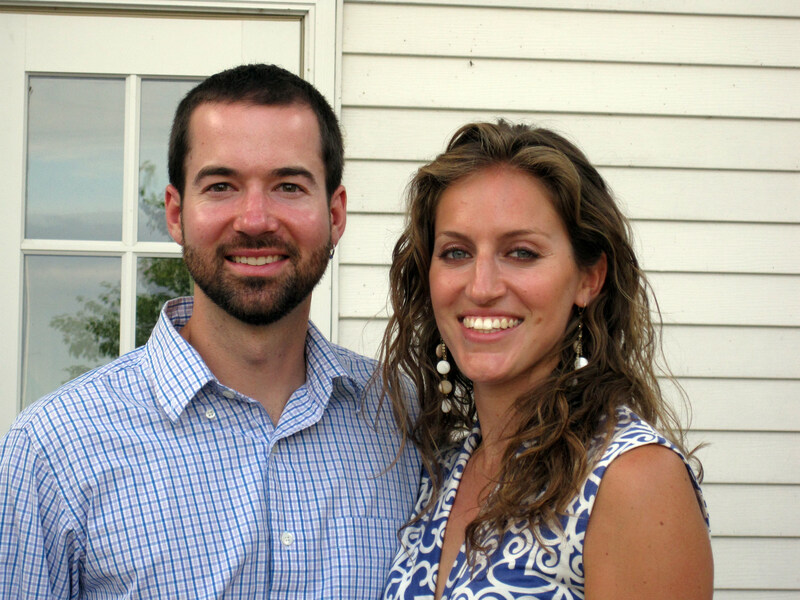 It’s been a very interesting month and a half since our last post – certainly our lifestyle has changed quite a bit. Since the first week of August, we have driven from Portland to Seattle, flown all the way to Maryland for a quick visit, flew back again to Seattle, and then eventually drove back down to Portland once again. I’ll attempt to wrap it all up and fill you in on all the highlights, but beware, this is going to be a long post. I’ll never know if you just skip the words and head straight for the pictures. Just like all our previous posts, you can click on any of the pictures to enlarge them. However, for this post, I’ve increased the resolution to at least 1920×1080 pixels, full HD! From our last stop on the coast of Oregon back in early August, also the last night in the roof top tent, we drove inland to Oregon’s biggest city: Portland. Over the next few days we fell in love with this charming metropolis and felt like we could settle down here for a while. So that’s exactly what we set out to do. As newcomers, Portland appears to have a lot of the things we love, all in one place. Specifically we’ve found: an active outdoor culture (no coincidence that Nike & Columbia are based here), a local & healthy food scene, a technology centric economy (Intel & HP are based here), an environmentally focused local government and a geographically blessed location. 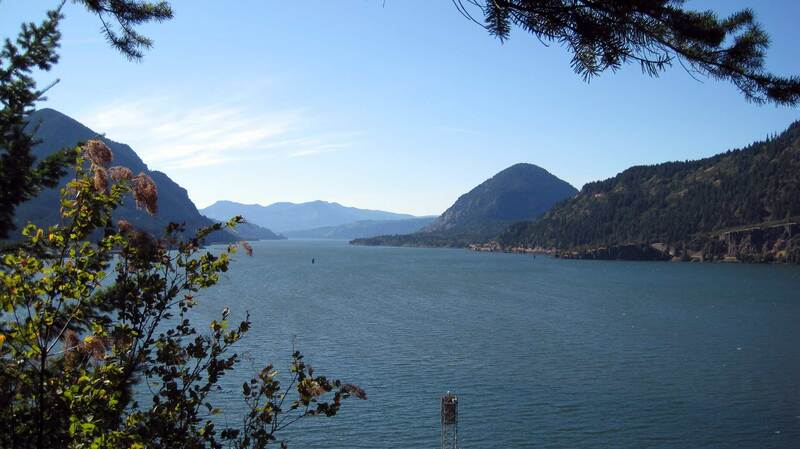 Looking at the map, Portland is nestled between some topographical marvels such as the mighty Columbia River & Gorge, Mt. Hood, Mt. Adams, Mt. St. Helens and we’re not far from the Pacific either. With the scenic Willamette river dividing Portland in half as it flows Northward towards the Columbia, you get a sense that this is a very dynamic environment. Not to mention there’s a very low risk of drought. Yes, we have noticed it rains here! As we’ve often found in our travels you can get a pretty good idea of a place based on its nicknames, Portland has many: The City of Roses (referring to the International Test Rose Garden), Stumptown (a hint to its roots as logging center), Bridgetown (many rivers = many bridges), Rip City (a TrailBlazer’s reference), Beervana, Beertown (tons of microbreweries), P-town, PDX (the airport code), Soccer City USA, and my new favorite Little Beirut (coined by the first President Bush after the city violently protested his visits). Before I get to far into Portland, let me explain how we got here… Our buddy Tim Hogan hooked us up with his older brother Michael who’s been living in Portland for years. Michael was heading out of town for a long weekend, so as we rolled into town, he and his crew were heading out. In exchange for house/dog/cat sitting, we got free place to stay for five days. It was a perfect setup to explore the city from. 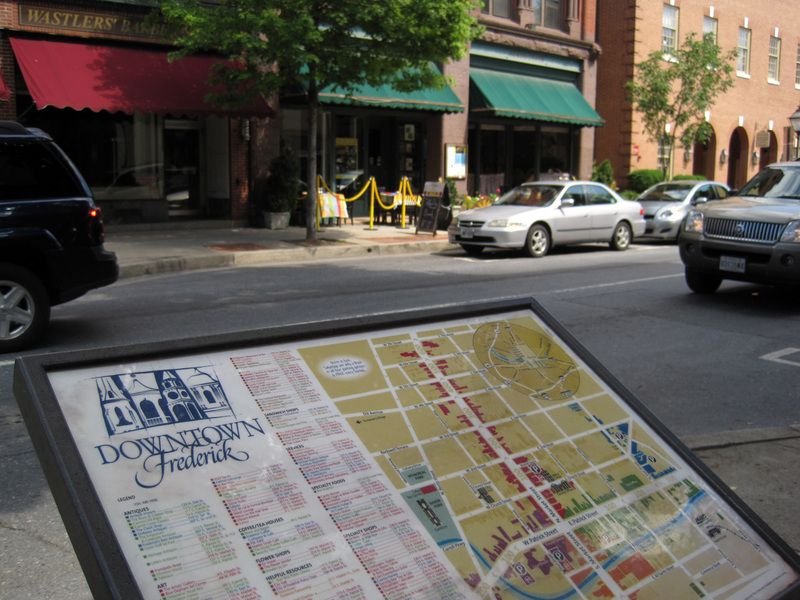 During that first week we looked for apartments all over town and spent time exploring many of its neighborhoods. We had focused a lot of our attention on the NW 23rd Avenue area, which we liked because it’s squished right between the famous Pearl Street district downtown and the sprawling Forest Park. We toured at least a dozen apartments in various price ranges, but weren’t finding exactly what we were looking for. What were we looking for? Well, we had hoped to find a short term lease on a furnished place somewhere near the city center, with easy access to Portland’s great public transport. We obviously didn’t want to be locked into a long lease before we find jobs, as their location(s) would be the deciding factor on where we ultimately end up. Also we don’t have (and don’t want to buy) any big furniture items right away. 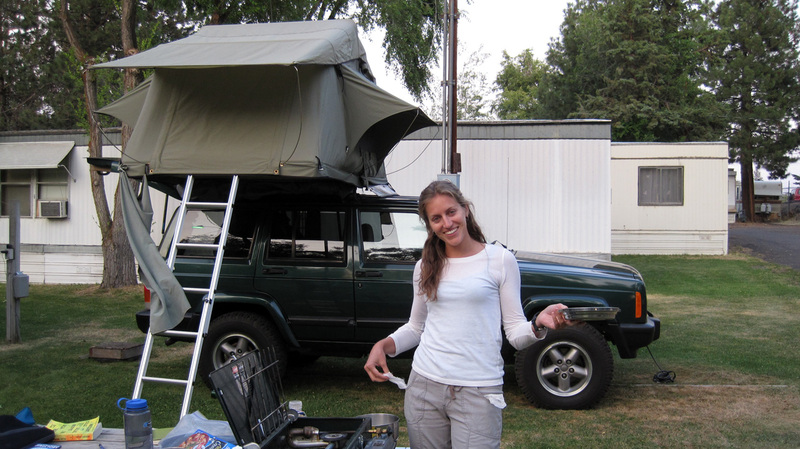 So the search went on that week, but before we found the perfect place, time ran out. We needed to get to Seattle for our flight back to Maryland so we’d arrive in time for Caroline’s sister’s marriage celebration. Our dear friends the Campbell’s (Dana & Matt and their twins Alex & Evan) live just across the Puget Sound in Poulsbo, so we spent a few nights catching up with them before our flight. 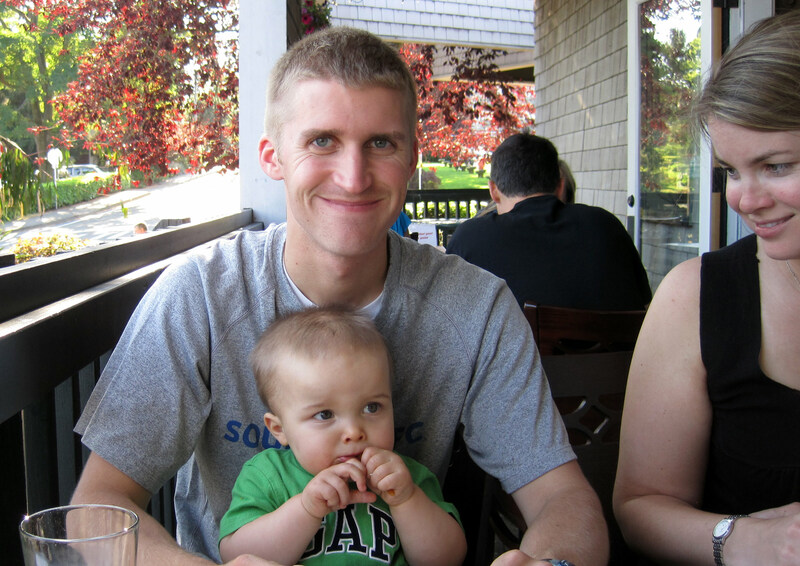 Our first visit with the Campbell's near their home in Poulsbo, WA. 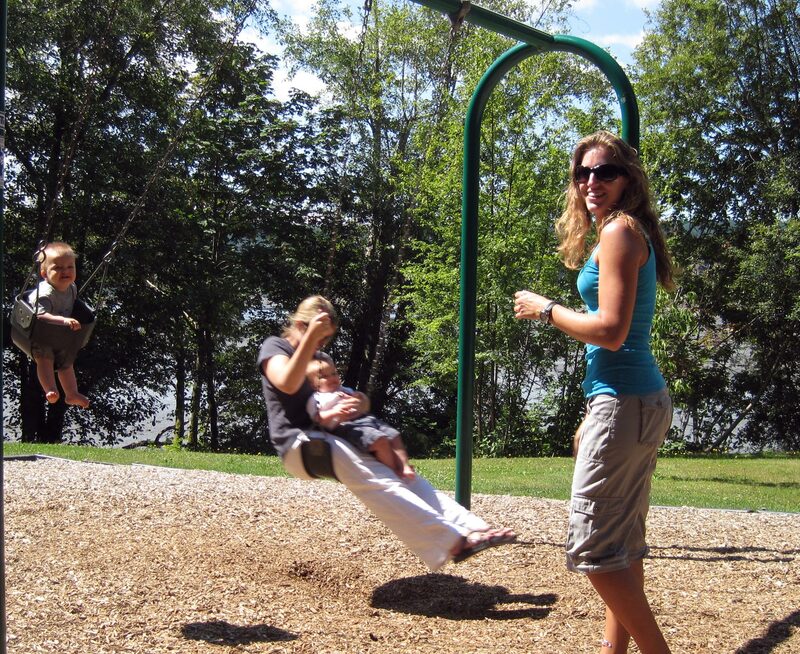 Dana and Alex swinging in the sunshine. Matt, Alex and Dana out at dinner in Bainbridge. 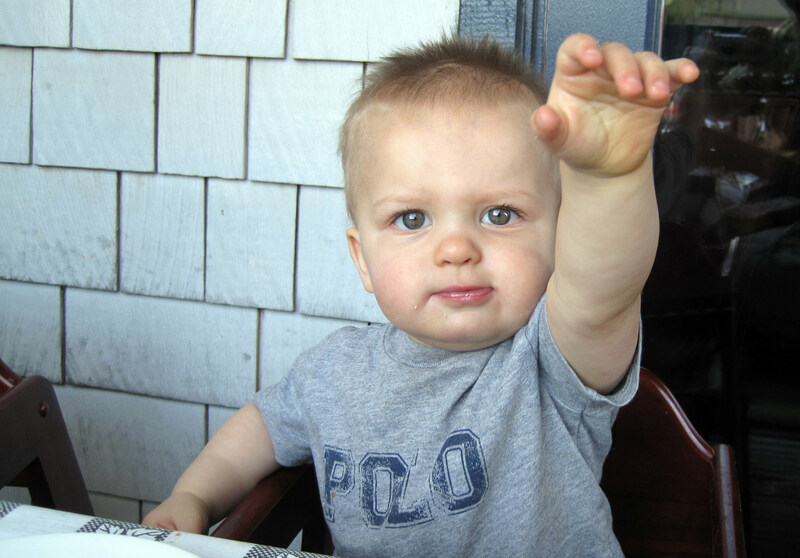 Evan either wants the camera or more food. Those boys can eat! Two days wasn’t enough time with the Campbell’s but we’d be back in Seattle before the month was over. 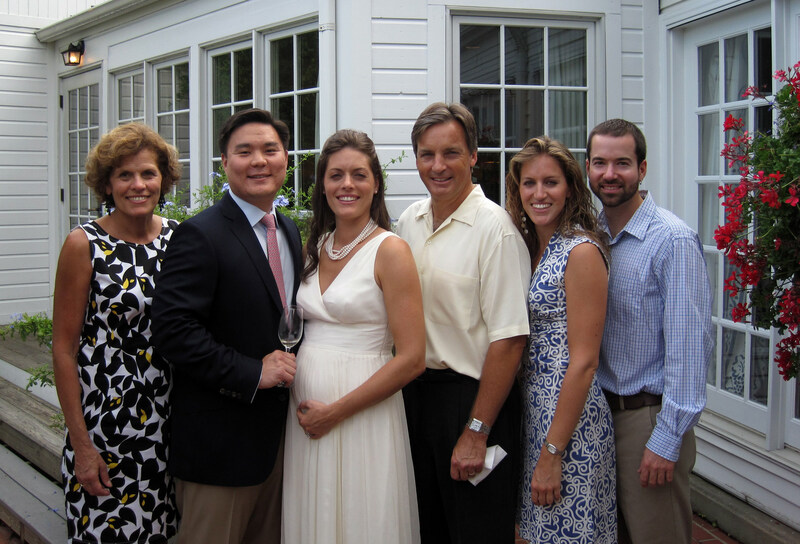 The event pulling us East was for Julie and Dan Han (Caro’s sister and brother in law), who were renewing their vows and hosting a celebration with both their families over the weekend at the posh Inn at Perry Cabin in St. Michaels. To top it all off the Gouin’s had rented an awesome Bay house for a family vacation the following week. We definitely couldn’t miss either! 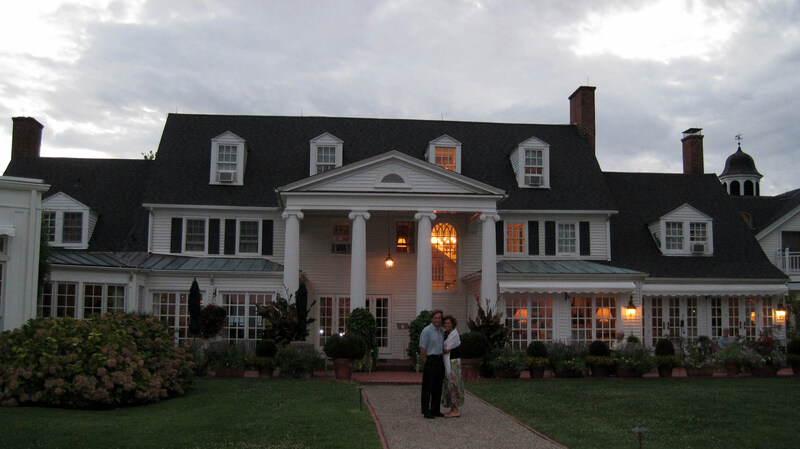 The Gouin's at the Inn at Perry Cabin, in St. Michaels, Maryland. Happy to have their girl back home again. 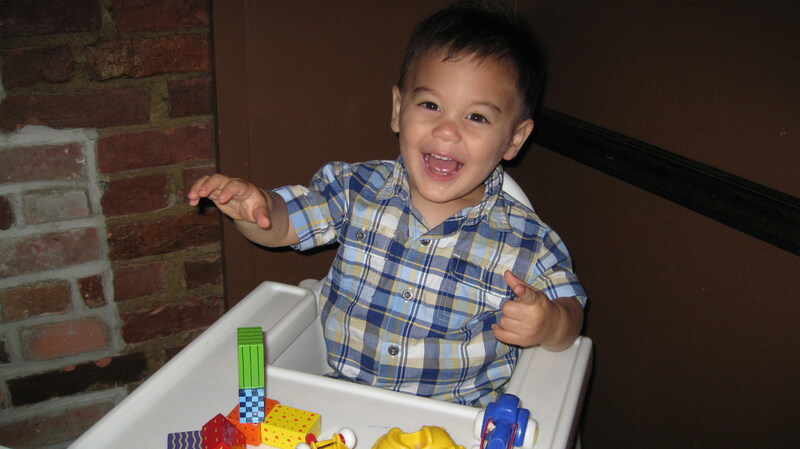 Photogenic Alexandre (Julie & Dan's son) entertains us all at dinner. 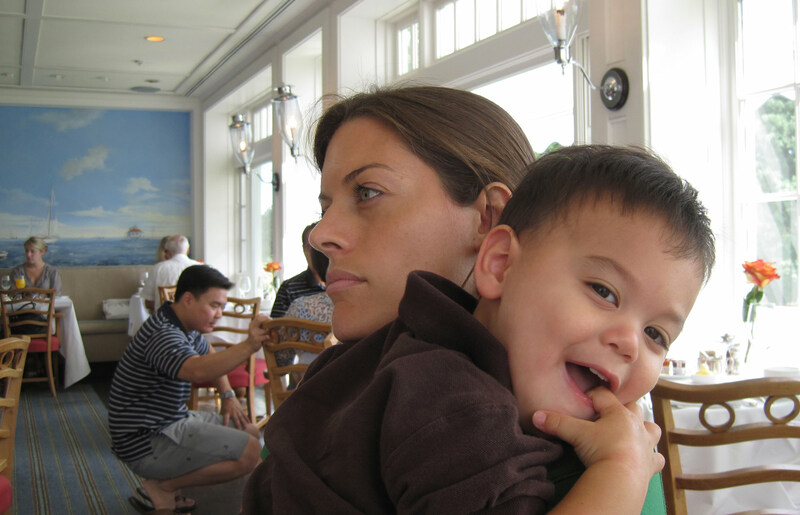 Julie & Alexandre at breakfast, Dan's hiding in the background too. We found The Inn's Eggs Benedict lived up to its reputation. 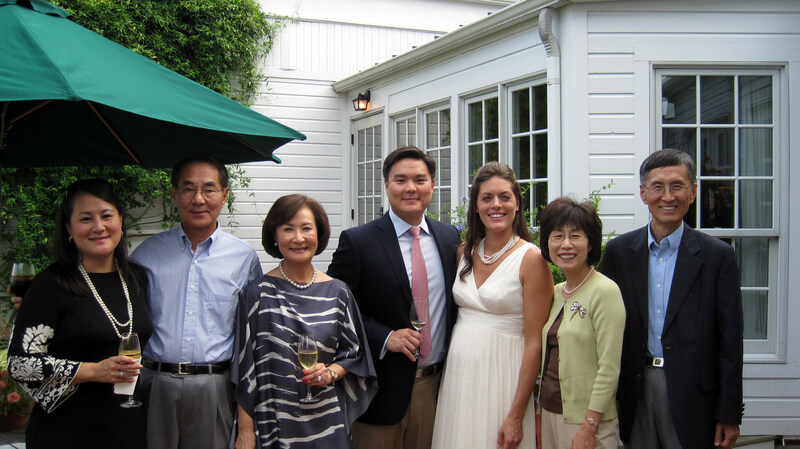 The Han's and their Pastor. 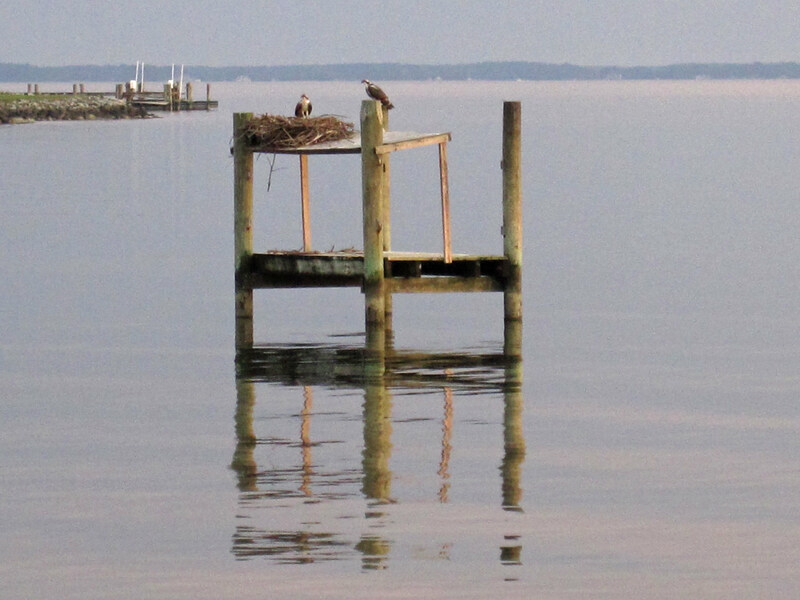 We spent the whole next week at a lovely property on the bank of the Choptank river, overlooking a wide expanse of the Chesapeake Bay. The house was awesome, it had everything you could possibly need to enjoy the area. While we spent most of the time hanging out by the pool, we also: went for runs down the backroads, canoed along the river, played air hockey in the rec room and just lazily read books & surfed the web. It was perfect. Thanks again to both Julie & Dan and Bernard & Denise for a wonderful week and a half! 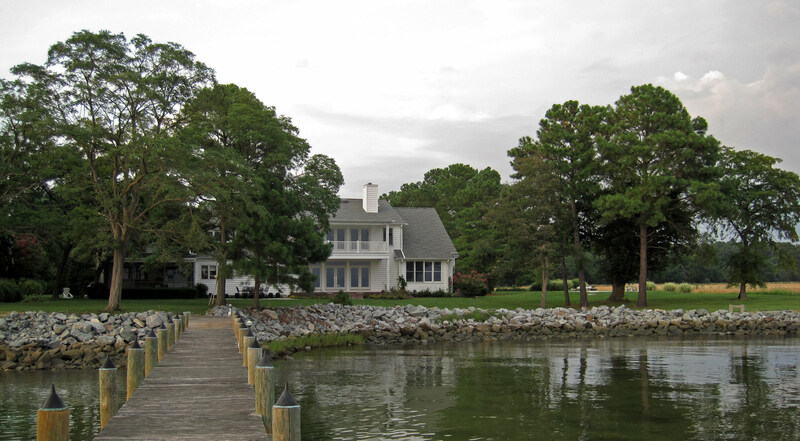 Relaxation came easy at this beautiful estate on the Choptank River. Complete with its own Osprey nest. Plenty of rooms with spectacular views over the water. 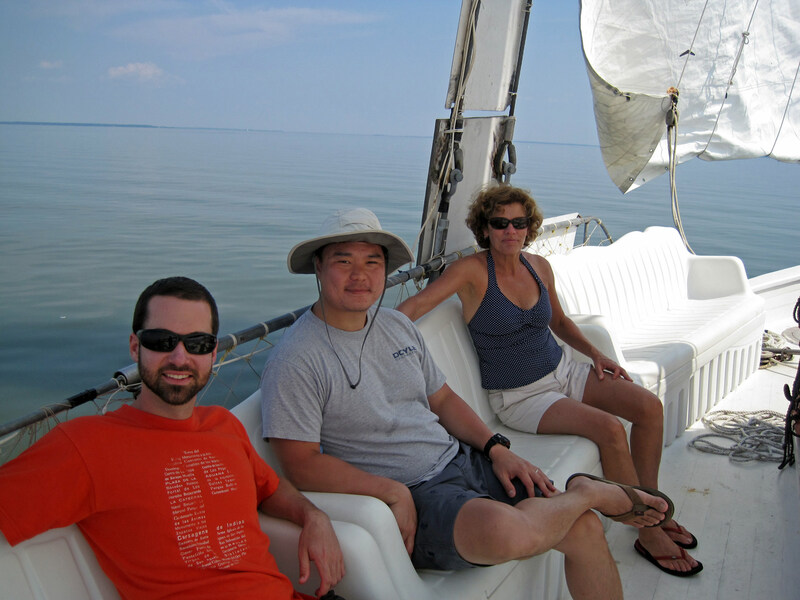 During the week Dan treated us to a Bay tour on an classic Skipjack sail boat. The rusty old captain took us out for a couple hours and educated us on life as a Waterman (pronounced Woutermen). From crabs to oysters all the way to environmental politics, the Captain sure had lived an interesting life. 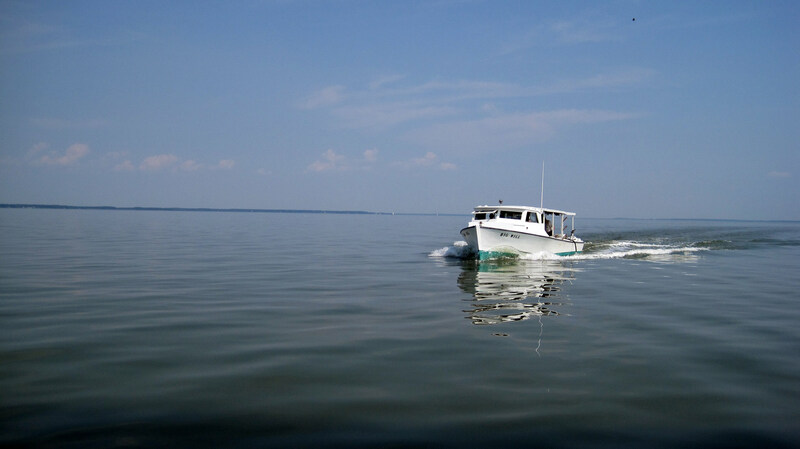 It was a beautiful day out on the bay. ...while we all enjoyed the shade. 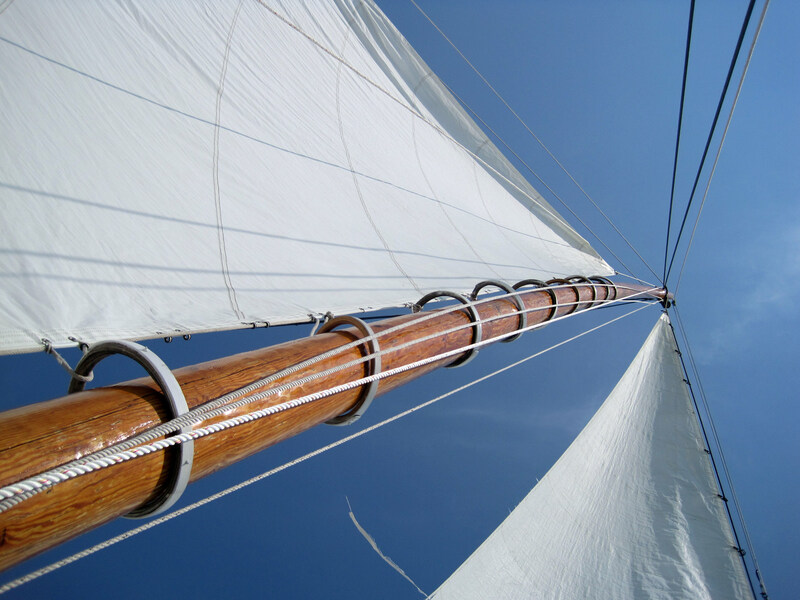 The wind picked up and eventually caught the sails of the beautiful old ship. Another 'Waterman' comes back in from a day on the Bay. 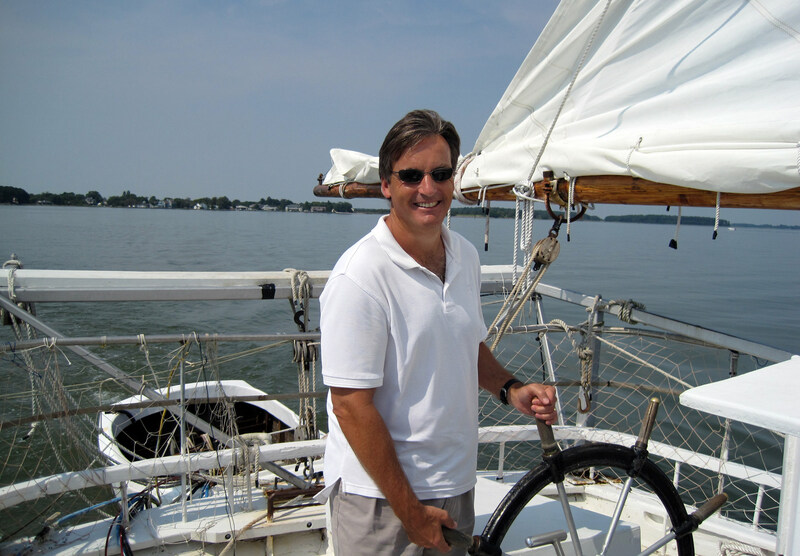 During the week at the Bay house, we had been in touch with Michael back in Portland who had come up with a very creative offer. It turned out that he and his girlfriend were planning to get a place together which meant that his home, that we had previously enjoyed, would be available for rent. 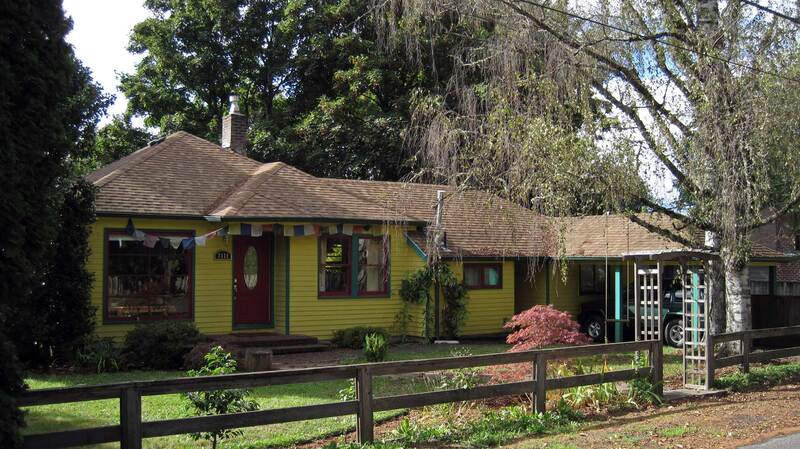 Suddenly, we had a place in Portland that was short term, furnished and quite a step up from an apartment! It was a bit of a scramble as we had only two and a half days back in Frederick to prepare for our official ‘move’ out West. 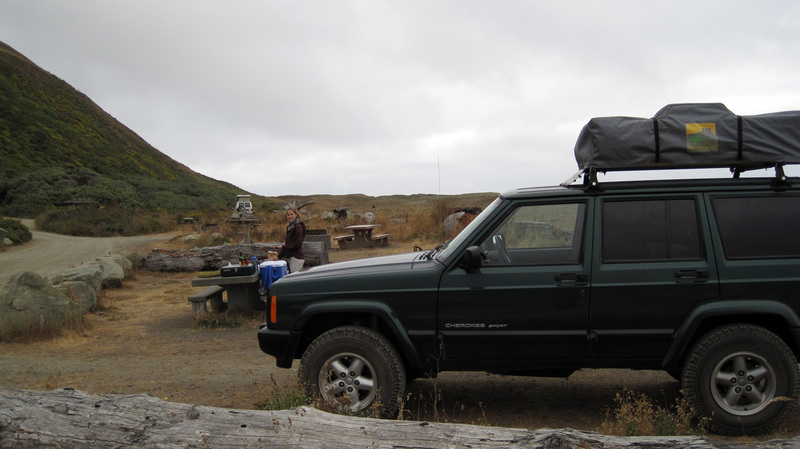 While all the things we needed to thrive during this past year of travelling do fit nicely in the Jeep, we aren’t quite as ‘fast & light’ as we make ourselves out to be. The truth is that many boxes of our ‘stuff’ were collecting dust in our Parents’ basements. Eventually, we were able to pare down our remaining essentials to eight big boxes and ship them via USPS for a cool $340, about a dollar per pound. All in all, a very economical move cross country! So, it was yet another sad goodbye to our folks. By now they were starting to get used to the idea of having us close by and so were we. We hopped on board Delta to make our way back home, to the Northwest! We scheduled our move into the house around September 1st which gave us almost a week to spend with the Campbell’s in Poulsbo, Washington. 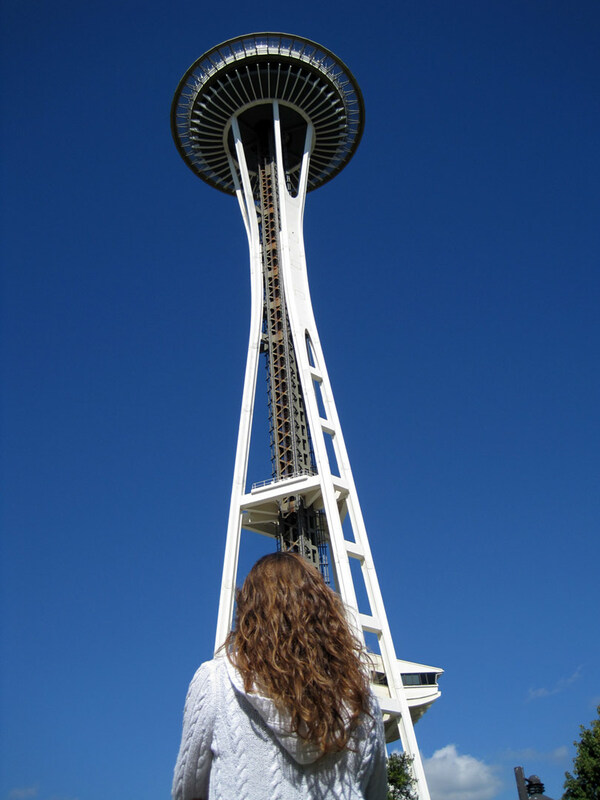 The Space Needle towers high above. We caught a rare glimpse of Mt. 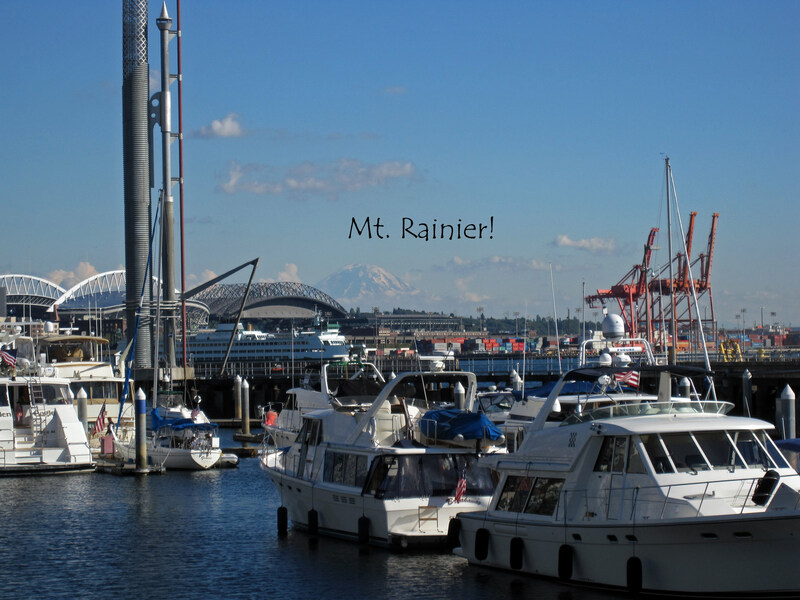 Rainier from downtown. 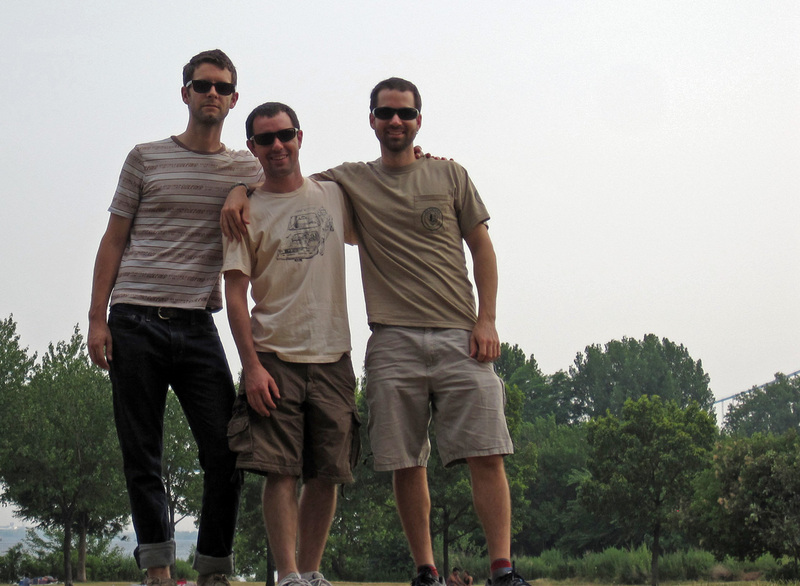 My buddies and I were standing on its summit five years ago. Time flies eh? 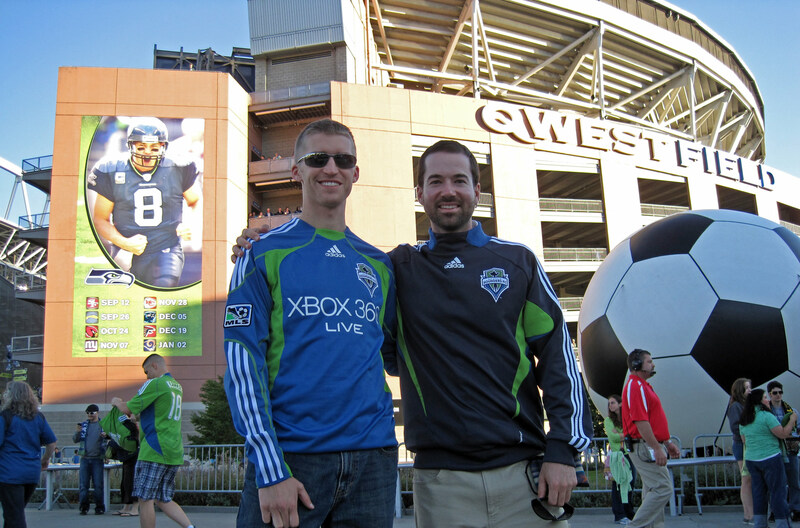 Matt took me out to a Sounder's MLS game, it was fantastic. 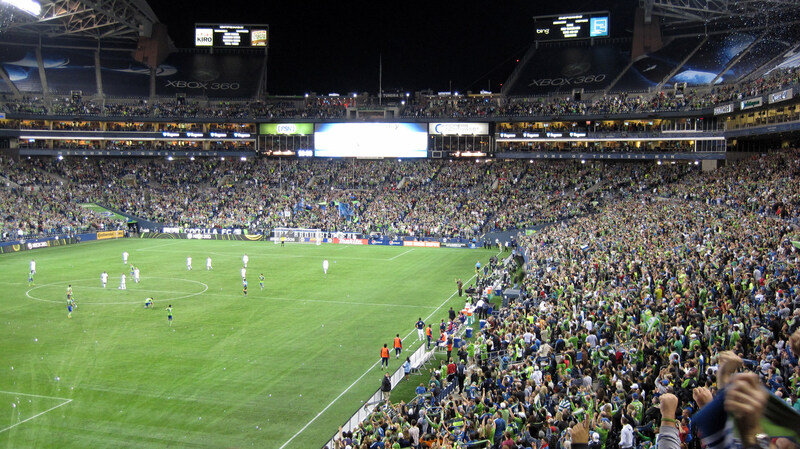 The Sounders pulled off a come from behind 2-1 victory with a goal in the 92nd minute! A packed house cheering on the Sounders, MLS is BIG! 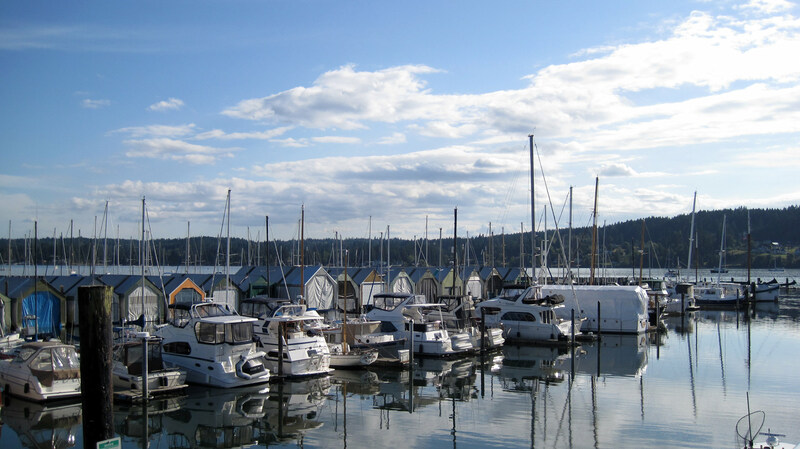 A quiet afternoon at the Poulsbo Marina. 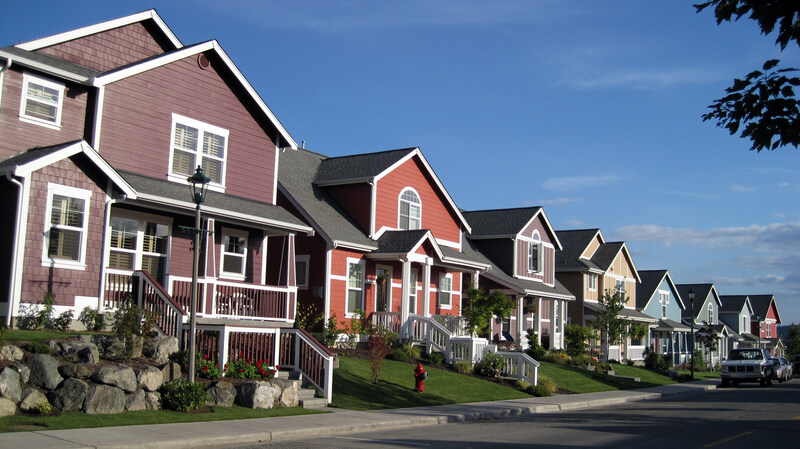 The Campbell's charming & colorful neighborhood. 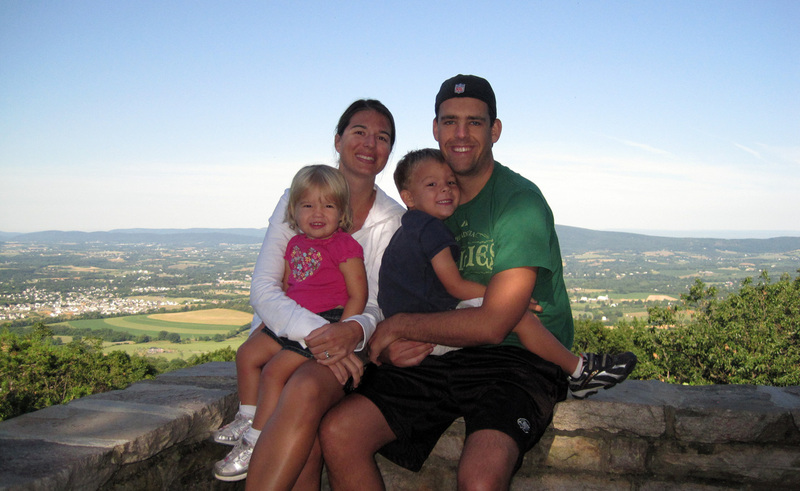 We had such a good time with the Campbell’s – it was really hard to leave. In addition to the soccer game, Matt even helped me change the oil and transmission fluid in the Jeep, we (the Jeep and I) were very grateful. It’s fun to have those guys so close. Can’t wait to make it up there again soon. While we were in Poulsbo, we took advantage of another lucky connection. My best friend Dave has an aunt and uncle who live just outside of town, literally ON the water. Camp Guertley as it’s known sits right on the Hood Canal and boasts an armada of watercraft. It was so nice to finally meet Gerry and Barb after hearing so much about them from the Hartley’s family vacations out there. They lent us some kayaks for the afternoon on the wide canal. During the paddle a Ohio class Nuclear submarine (a ‘Boomer’) was being escorted through the bridge by an impressive swarm of Coast Guard and Navy ships, perfect timing! What an impressive sight, and quite rare too, it gave me a strange urge to join the Navy. The sun was about to set so the water had that neat sparkle to it and then here comes a sleek two billion dollar black machine towards us… Unfortunately for you guys, we forgot our camera that day – sorry! 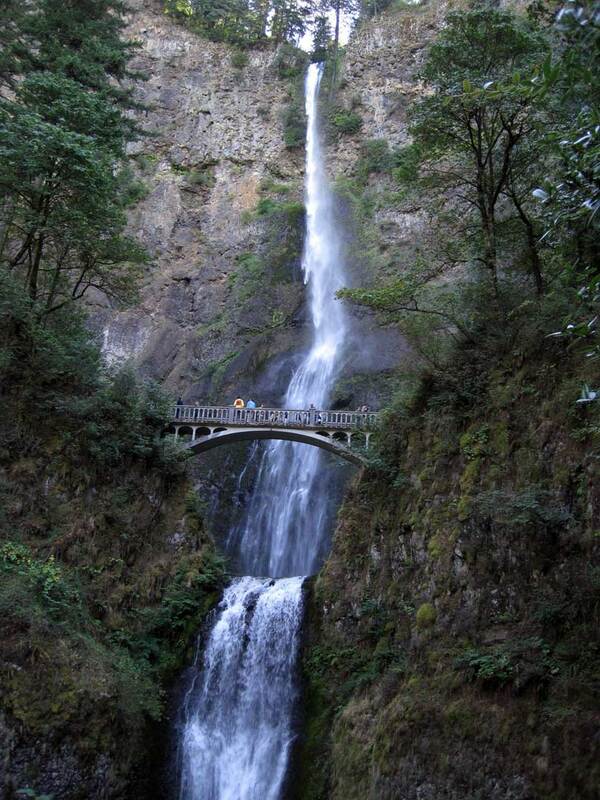 Striking Multnomah Falls in the Columbia River Gorge, less than an hour from the house. Looking West down the Columbia river from a hillside along the Gorge. Fall is in the air already here in Oregon. 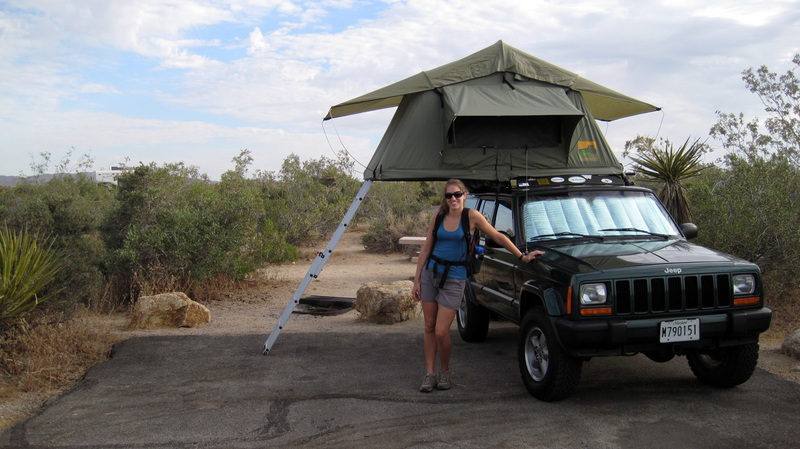 We've replaced the roof top tent with this 'House' contraption, it's much more spacious and completely waterproof! Well, now the real adventure begins. As we get settled into our new home, make some new friends, and look for interesting and rewarding careers we keep in mind all that this past year has taught us. Namely to be friendly, thoughtful, patient and to make a plan – then hope for the best! Luck favors the brave. This move might be one of the great challenges of our lives, and it certainly won’t be our last. 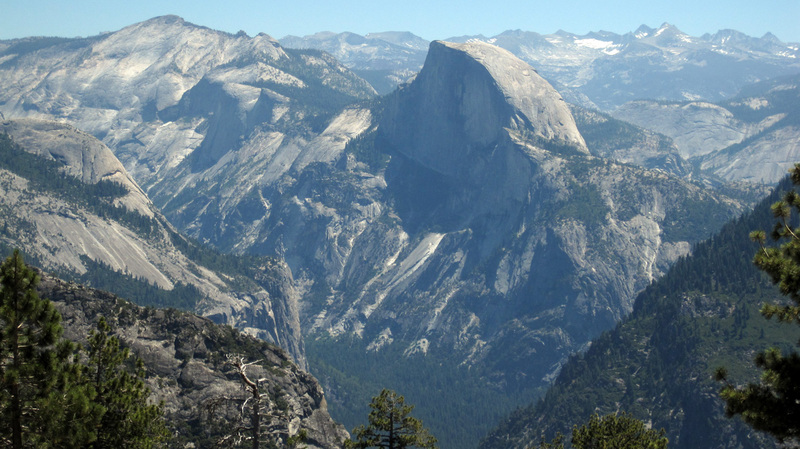 After a great few days in LA, we left the heat of the valley and headed to the beautiful and cooler Sierra Nevada’s to continue our tour of this nation’s bountiful national parks (we’re up to 20 now). 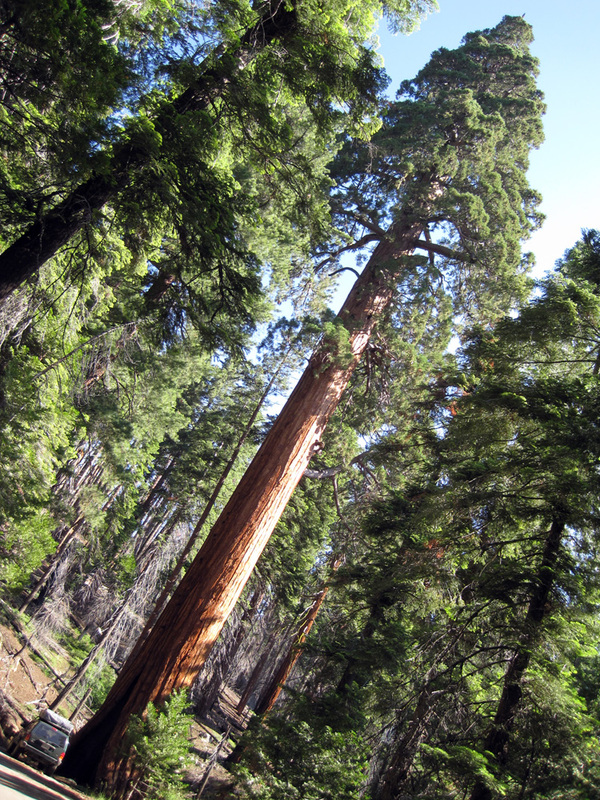 First on our list was Sequoia National Park, home to the world’s Big Trees – the biggest on the planet. 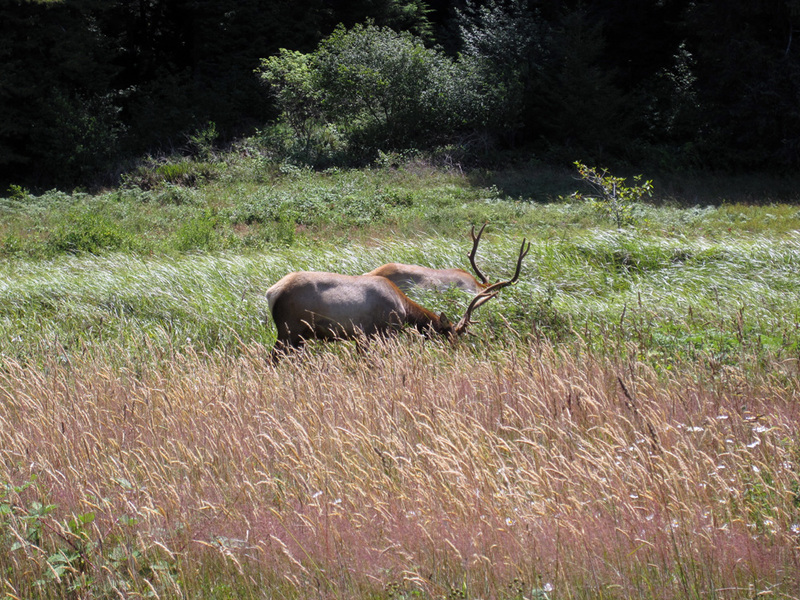 We were so excited to meet some of these giants as we followed the remote and mountainous road up to the Mineral King canyon. Sequoias grow between 5,000 and 7,000 feet in elevation, so we were getting into optimal range. They are not hard to miss. This gargantuan tree sticks out amidst red pines and cedar trees. Their trunks are massive and stay that way all the way to the top. Based on their voluminous trunks, they are the world’s biggest tree. Not tallest, not widest, but largest. The only possible way we could fit this Big Tree (aka Sequoia) in the picture. When we reached our campground (now above 7,000 feet), we started up on a 7-mile return hike up to the beautiful alpine Eagle Lake, passing rushing waterfalls, large sinkholes and even snow patches at almost 10,000 feet. We witnessed a few kids going for a dip, but we refrained and warmed ourselves by the edge. Later that evening, we did as all other campers do at national parks – attend an evening ranger program. 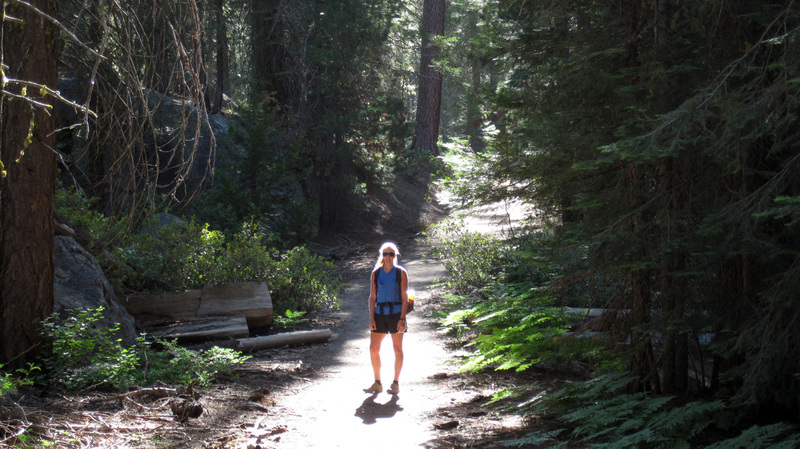 On our hike in Sequoia National Park through Mineral King canyon. 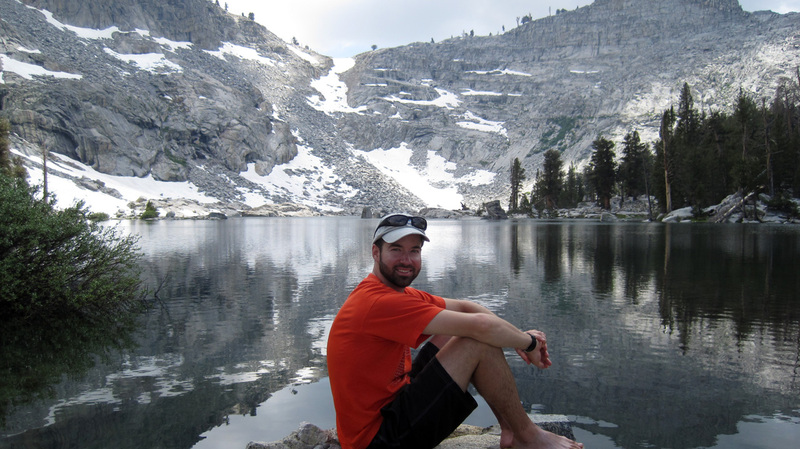 We reach Eagle Lake – a pristine alpine lake in the park. Our camp at Mineral King – cooking up some pasta. After a cool night up in the Sierra, we descended the 35-mile road down to the foothills and entered the most commonly visited section of the park into the big Sequoia groves. 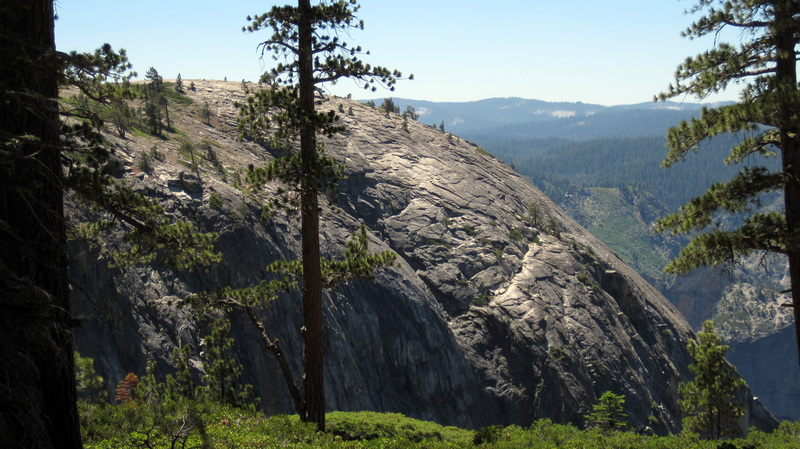 We were once again in prime elevation and saw Sequoias jutting out above us next to the road. 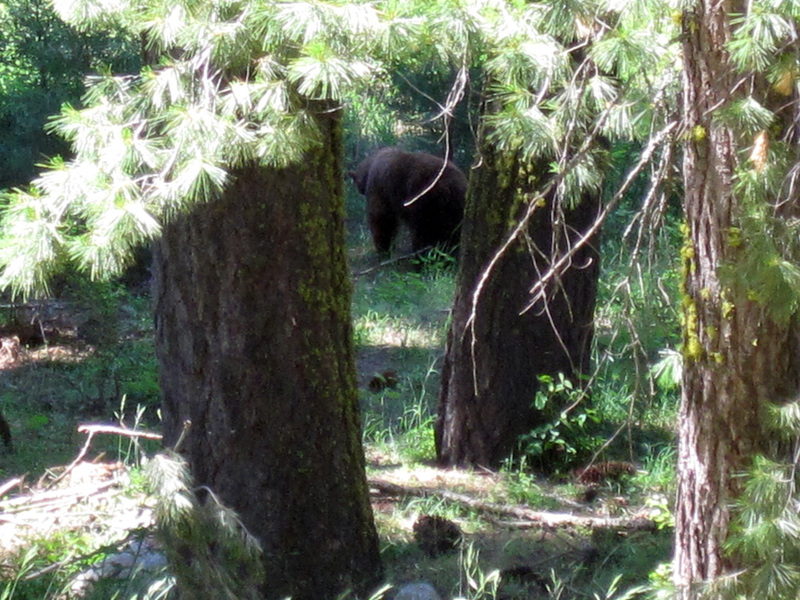 We hiked the short distance around the Big Tree loop and spotted a total of 6 black bear that day! 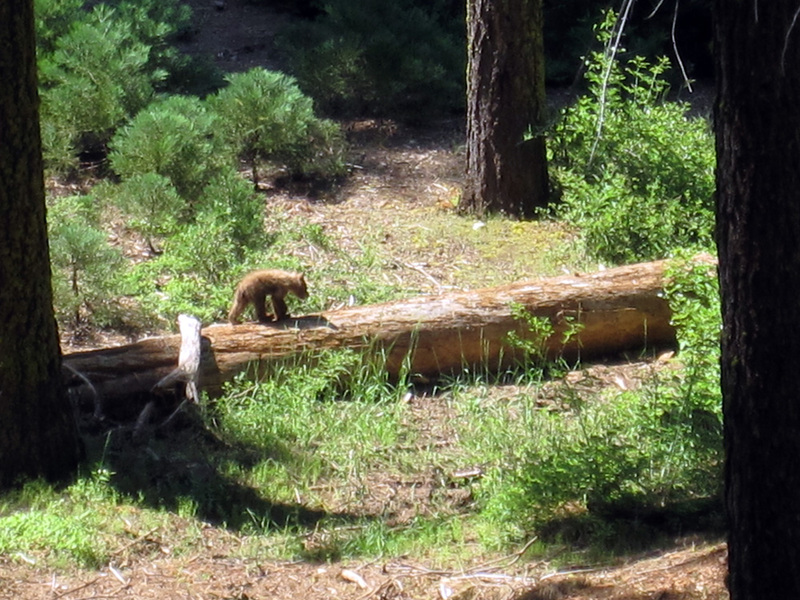 A few cubs here and there, and also a mother bear at a safe distance. 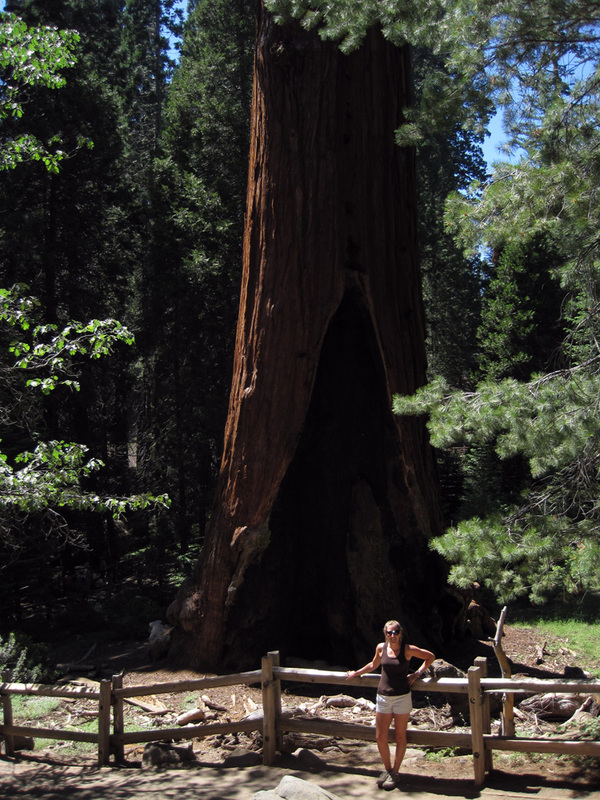 We are also very proud to have visited the biggest tree on earth – the General Sherman – 1,487 cubic meters, 275 feet high, and about 2,300 and 2,700 years old! A truly impressive sight. It’s very difficult to grasp the grandeur of this tree (and of all Sequoias for that matter), without looking up at the giant column, impervious to insects and fire. 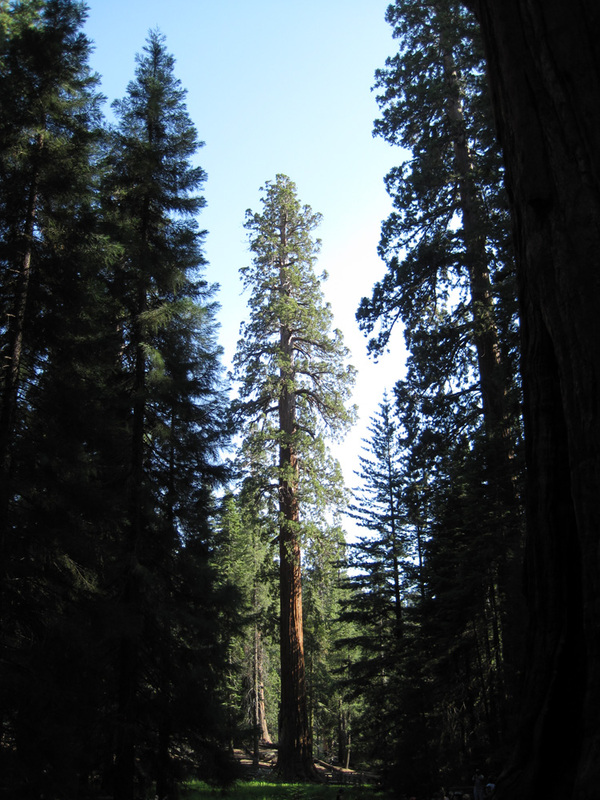 It has been able to withstand what no other trees (besides the Redwoods) could, and easily dwarfs human existence. A little bear cub roaming around. Peering up at the biggest tree on earth - not widest, not tallest, but biggest. 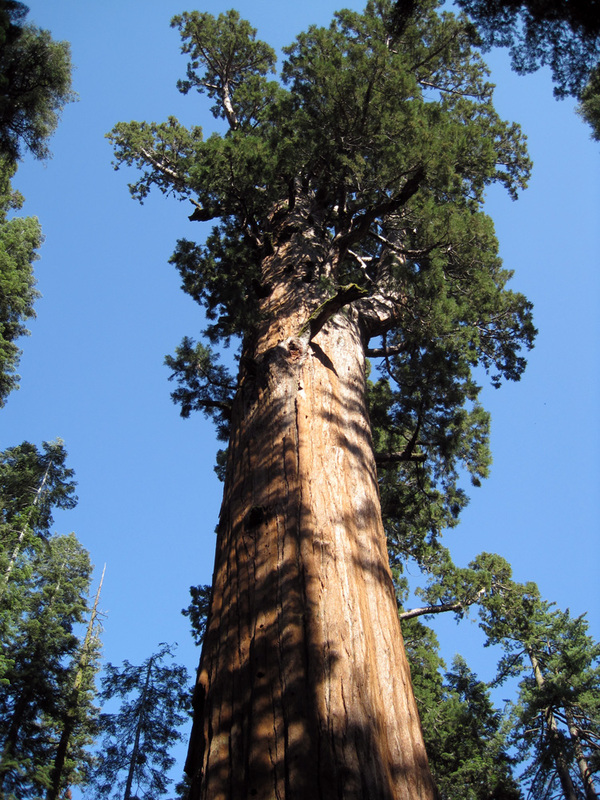 There it is, from top to bottom – General Sherman, the world’s largest tree, by mass. The world’s second biggest tree – General Grant, also the nation’s official living Christmas tree. 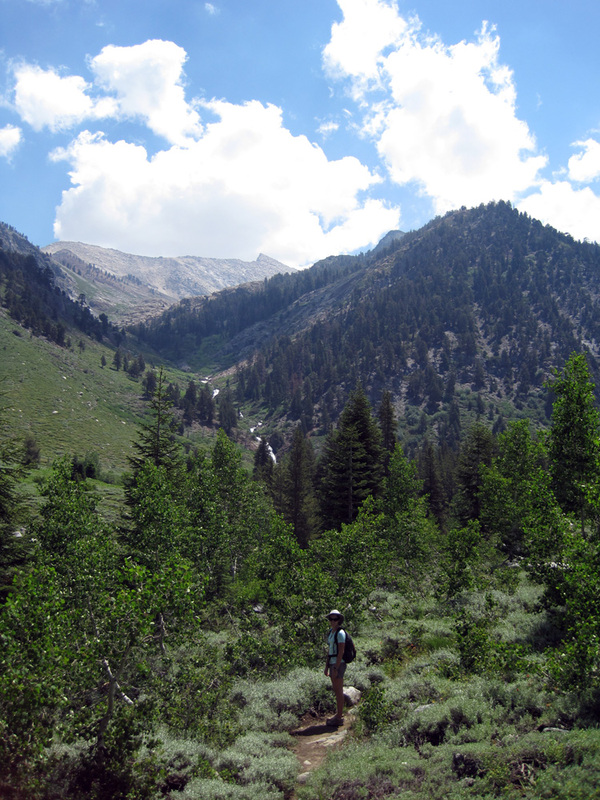 Once our necks became sore from looking up so much, we continued north into the next national park – King’s Canyon. Although we didn’t spend the night, we drove down and back up this canyon along the white water rapids of the King River that seemed to go on forever. It was breathtaking! 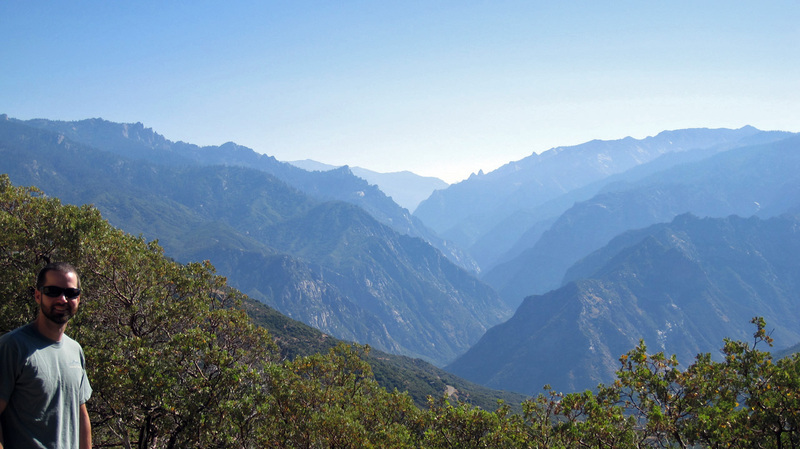 The view from the road going into King’s Canyon National Park. 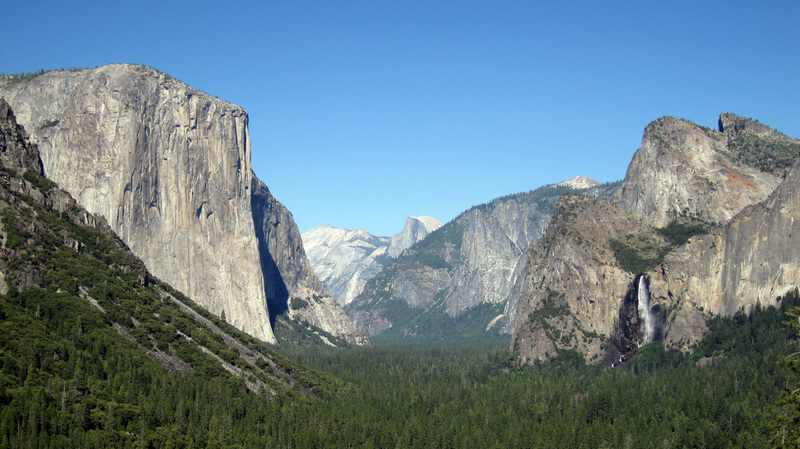 Next up: one of the most famous National Parks in the United States – Yosemite. With 3 million visitors a year, we were not surprised to see so many cars on the road, especially during the summer. But once you ge through the road work and past the main tunnel, and have a first look at the valley, you understand why. You’ve got thousands of feet of granite walls, one of North America’s highest waterfall, beautiful meadows and miles of back country that are barely visited. We got lucky and headed out north of the valley (mostly because the valley was full and by reservation only) and found a campground tucked in the forests away from the crowds (no running water, only vault toilets – that’s why). There was a trailhead right there, and we chose to do a 17-mile round trip hike that took us all the way to the top of El Capitan. It was a long and tough climb, but gorgeous, and we had it all to ourselves! And once we reached the top, it was an amazing feeling. I felt like we were on top of the world. 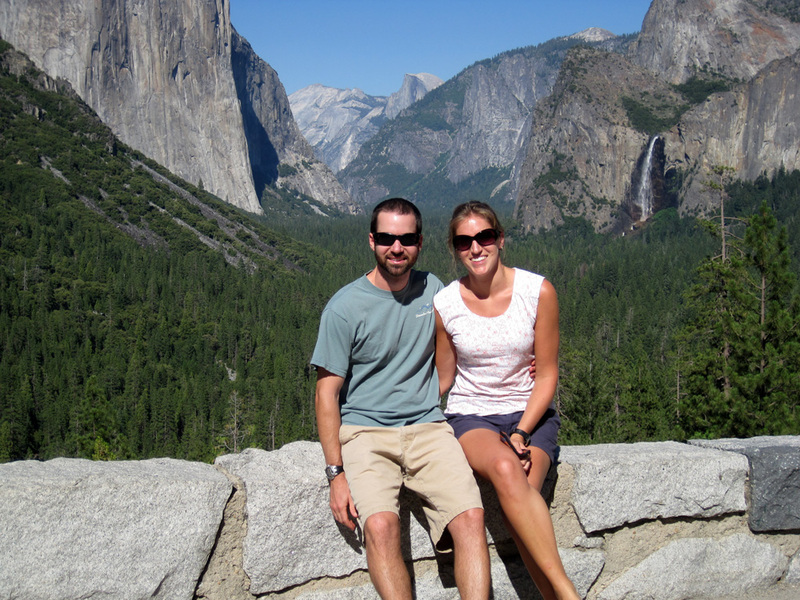 The great Yosemite Valley behind us. 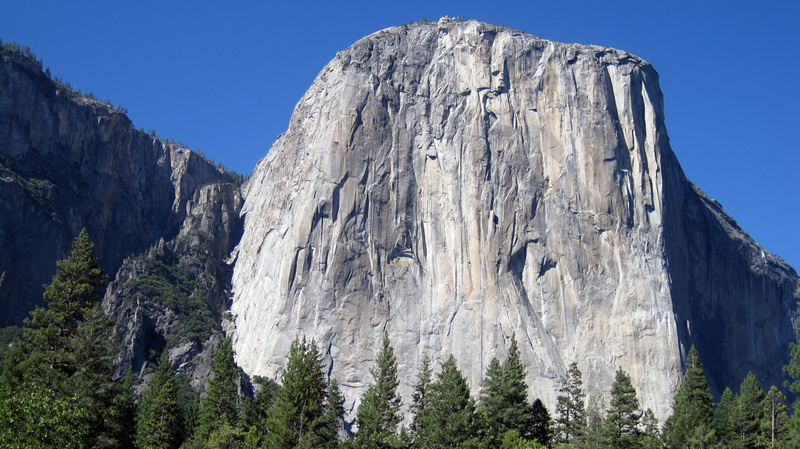 Starring up in amazement at El Capitan – no wonder it attracts so many hard-core climbers. At the beginning of our 17-mile hike up to the top of El Cap. The first sign of El Cap! 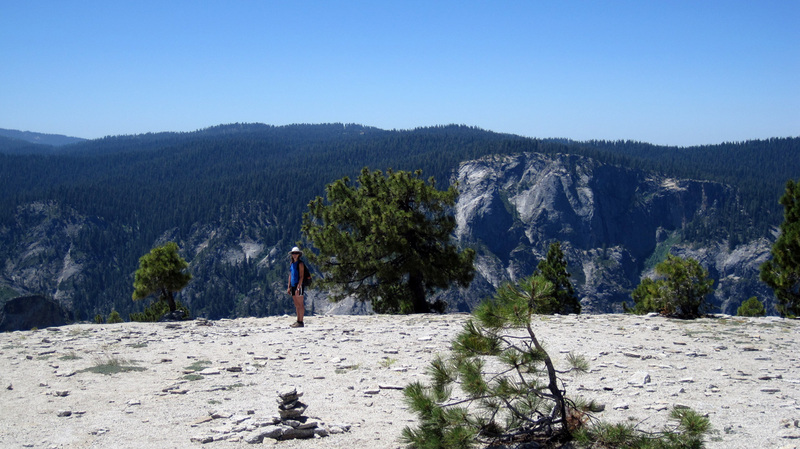 A great view of Half Dome as we near the top. 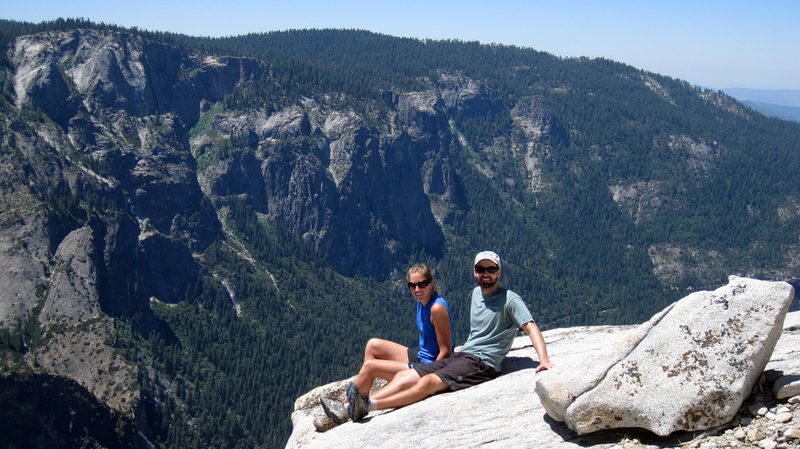 Here we are – on top of El Cap. We couldn’t see the edge of El Cap yet, so we continued walking down and saw another hiker braving the trek down to the precipice. We finally arrived at the edge, or at least as far down as we were comfortable going. It was amazing! We even saw a helicopter flying through the valley that was hundreds of feet below us. We were high. 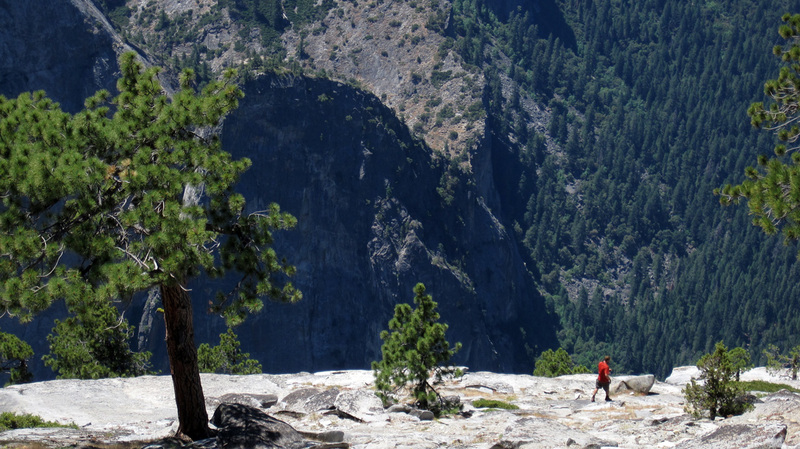 We had to walk down a ways before reaching the edge – another human soul braving the descent. 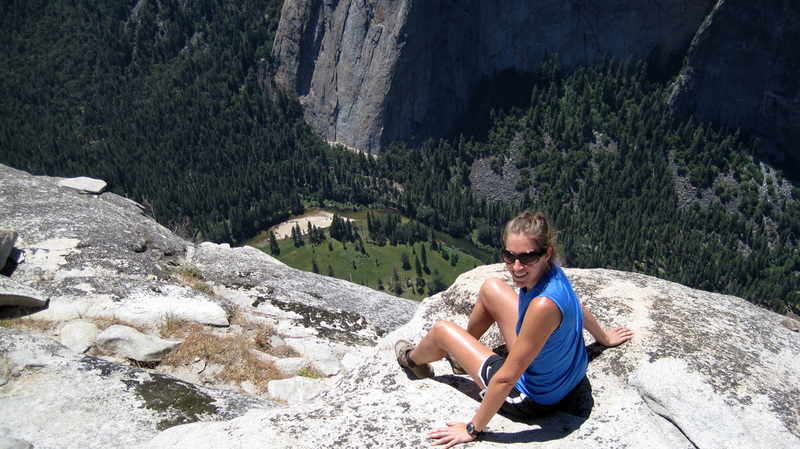 On the very edge of El Capitan – terrifyingly steep. You can see what I mean – holding on for dear life. After a wonderful tour of national parks, we headed back to civilization to recharge and visit family. We entered the Bay area, and Pat’s cousin Tim, his wife Marlena and their four lovely children Madigan, Daniel, Adam and Cara welcomed us into their home in San Carlos with open arms. We arrived on a Friday and spent a fun-filled weekend together that included picnicking at an open air concert, visiting the Monterey Bay Aquarium, biking and playing lots of cribbage (fabulous card game). 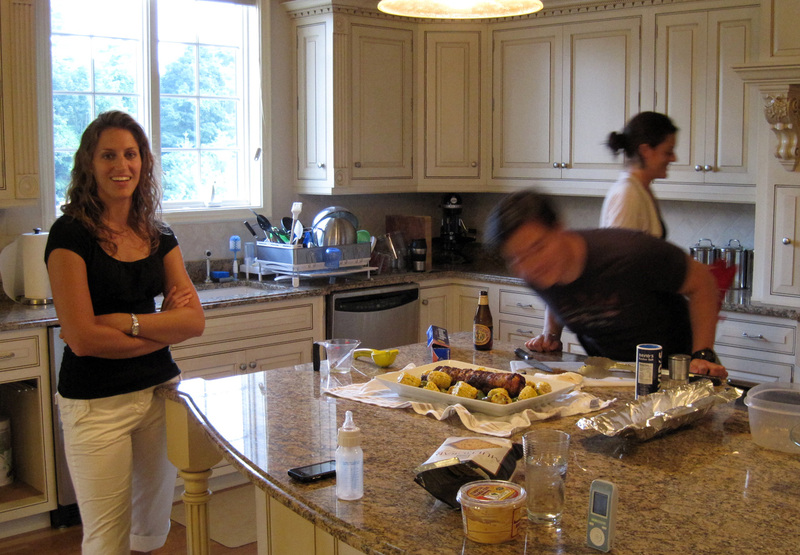 We had tons of fun with the whole gang and were grateful for their company and hospitality. Thank you Tim, Marlena and co. for hosting us and showing us a great time! We will certainly be back to visit again! 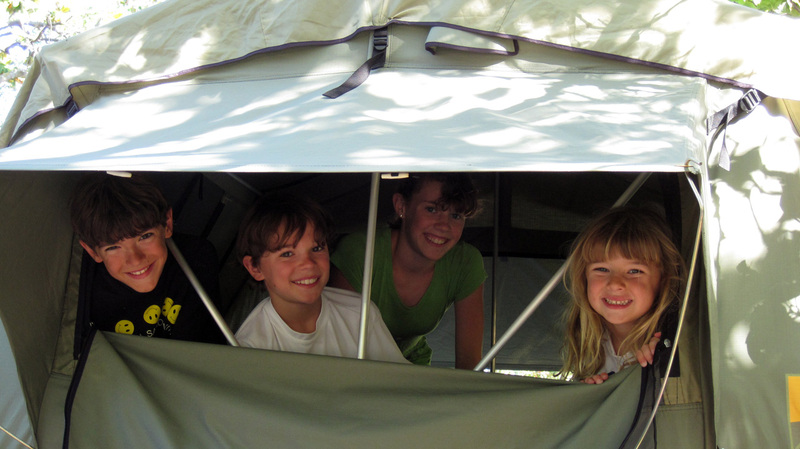 Adam, Daniel, Madigan and Cara trying out the roof-top tent. 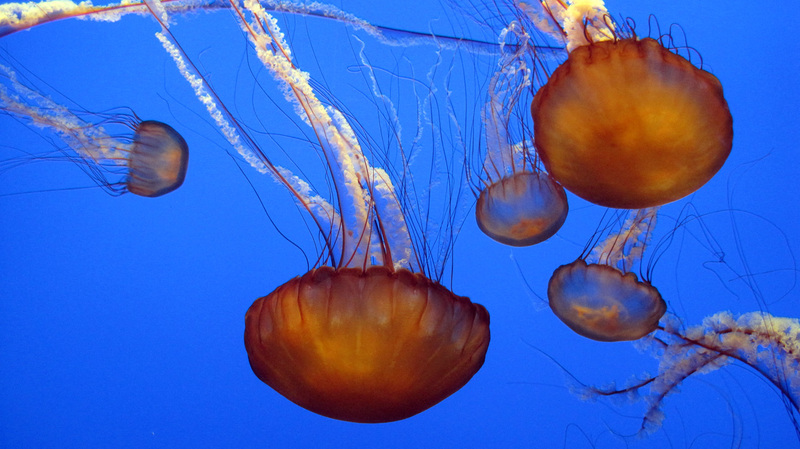 Awesome jellies at the Monterey Aquarium. We left the San Fran area a little before dusk on a Sunday night and had the privilege of driving through Napa Valley as the sun was setting. 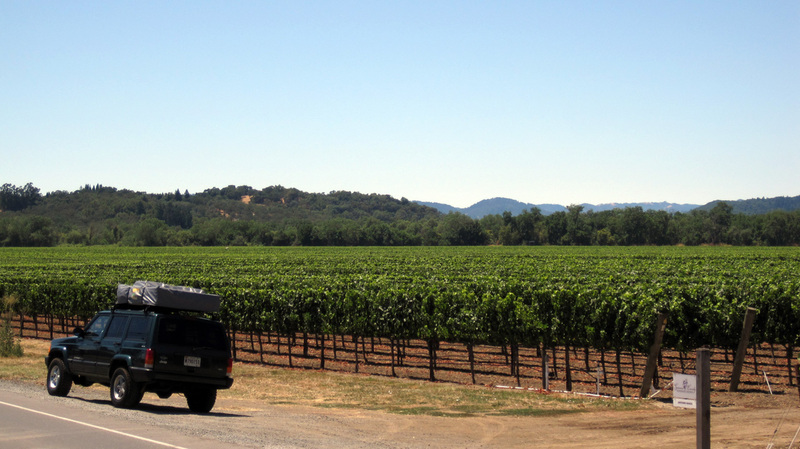 Although we camped in the Napa Valley State Park that night, we essentially passed through wine country without sampling any. A bit too pricey for our budget these days, so we’ll have to come back another time to do it justice. We drove through Napa Valley. 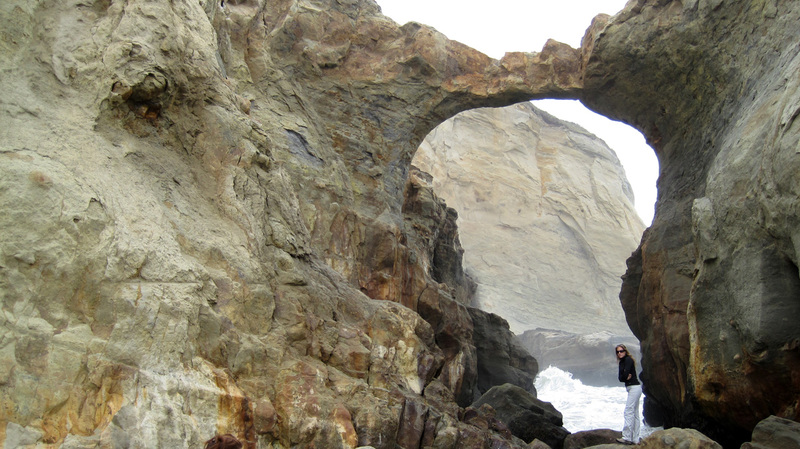 We were excited to head back to the coast and follow the famous 101 & Route 1 up the Pacific Coast. 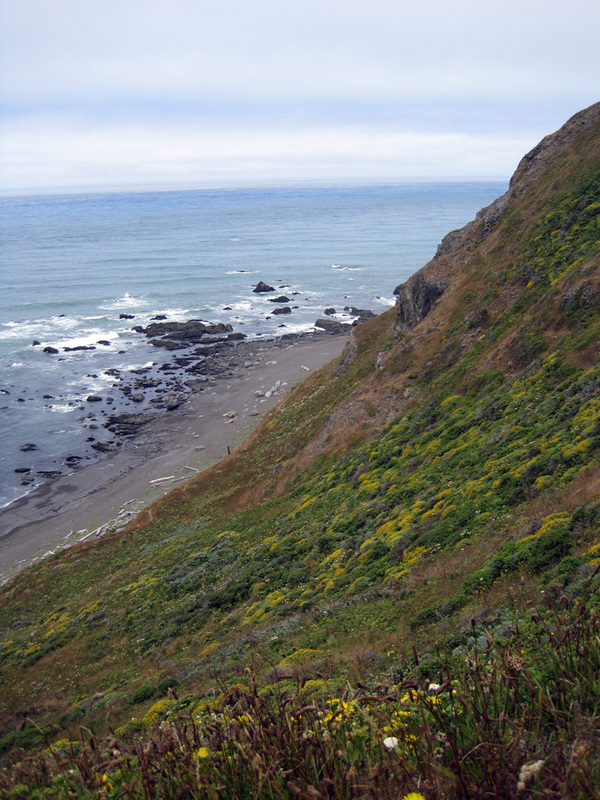 Once we reached, we were greeted with creeping fog over a dramatic cliff-side coast with intermittent stretches of beach. It reminded us a lot of the western coast of Ireland. 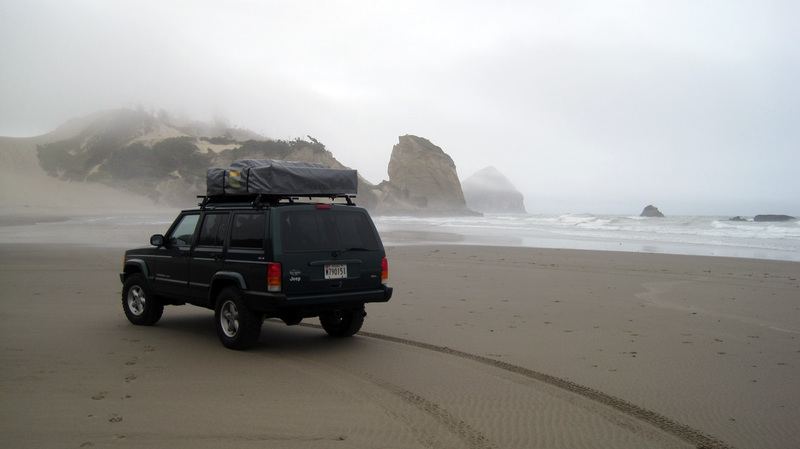 We tried to camp in some of the many California State Parks, but with the fee jacked up to $35 a night (and sometime $45), we settled for cheaper private campgrounds and BLM (Bureau of Land Management) areas for significantly less, much calmer, isolated and right up on the beach! It was considerably cooler and windier, but much more enjoyable in our opinion. 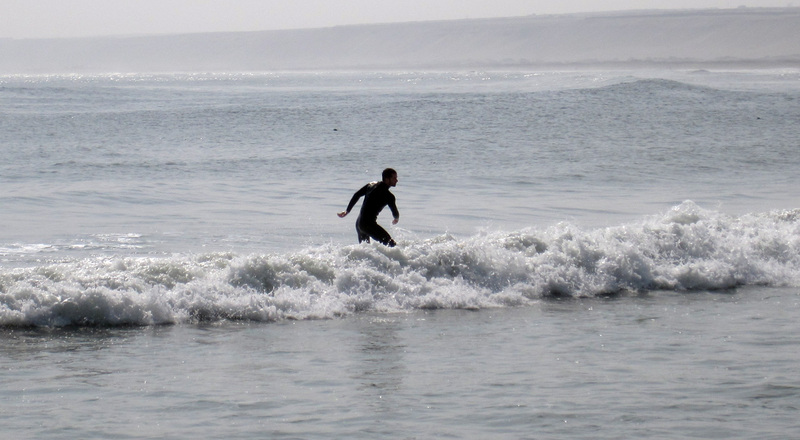 Of course you always have to look out for “sleeper” waves, riptides and such – we stayed out of the 60 degree water. 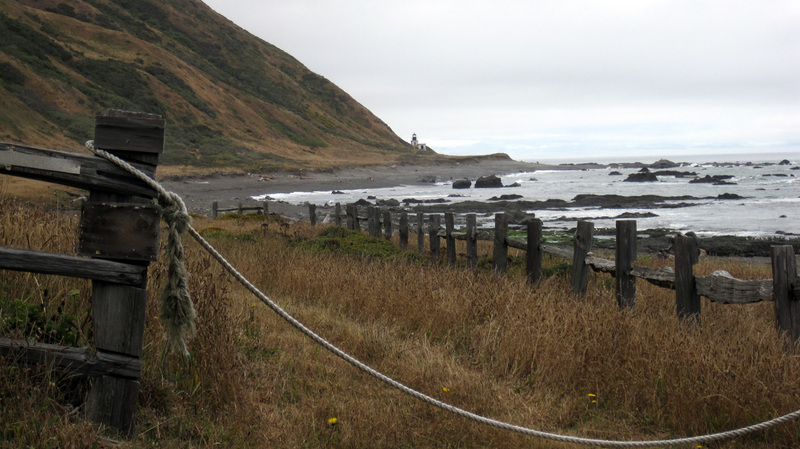 The BLM campground was part of the King Range Conservation Area, which spans over 35 miles of uninhabited Lost Coast. We hiked about 7 miles of it through sand, wheat fields and unpaved roads until we reached a small, abandoned lighthouse. We were met with a whole school of seals warming themselves on the sand. 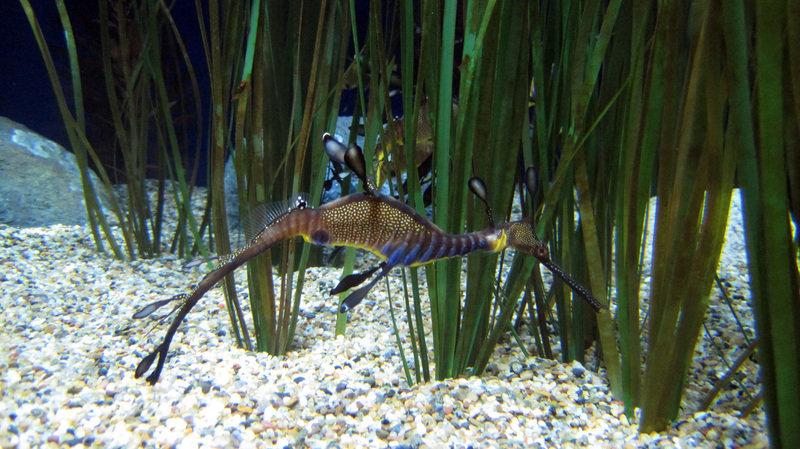 They were a bit shy, so we didn’t get too close. 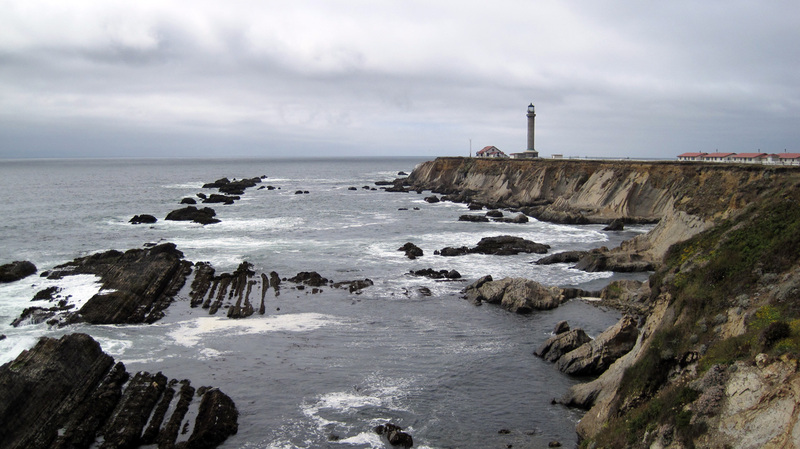 The striking northern California coast. 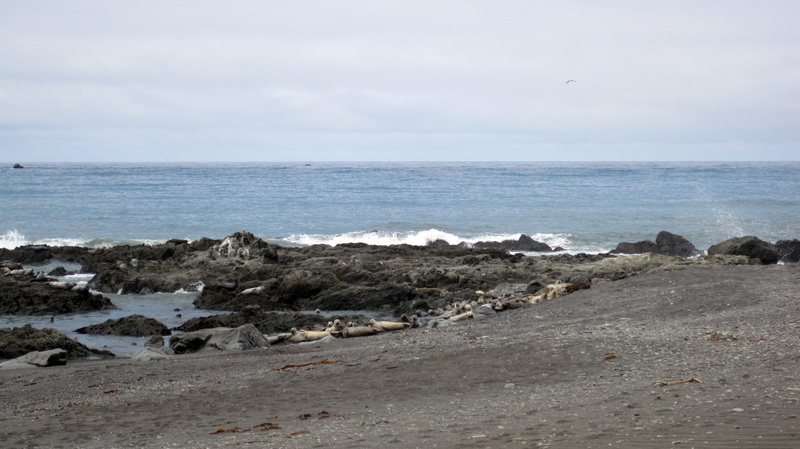 Our camp by the beach – remote and wonderful. We hiked up to an old light house. Seals warming themselves on the sand – they were a bit shy so we didn’t get any closer. We continued our journey north into the Coastal Range, natural habitat for the world-famous Redwood trees. Once again, we were awestruck by these wild trees, though this time not as much for their girth (though they are quite large) as for their height. They are the world’s tallest trees. 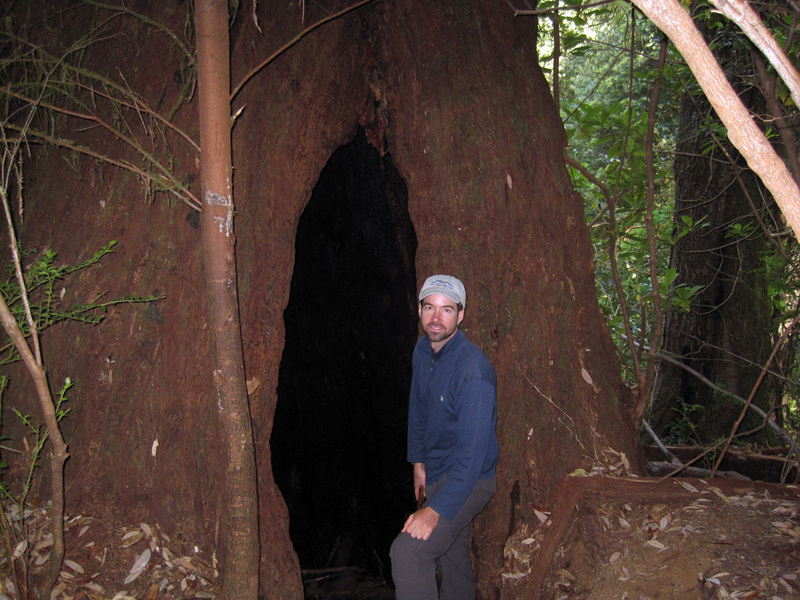 Unlike Sequoia National Park, they have kept the tallest Redwoods a secret from the public. Although we have read about their general location, there’s something thrilling about walking through the old growth and potentially passing by the world’s tallest tree without even knowing it. 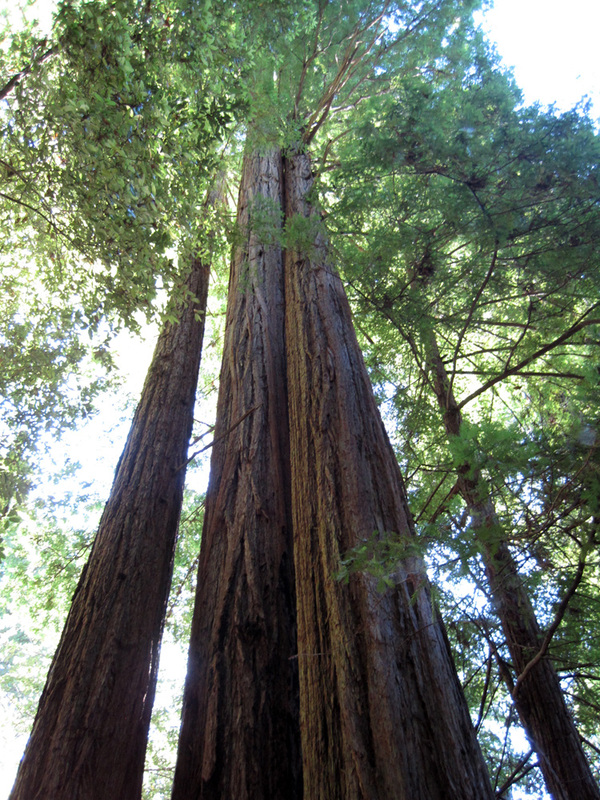 Like Sequoia's, Redwoods can withstand forest fires. Sometimes the fires carve out caves in the bottom of the trees. 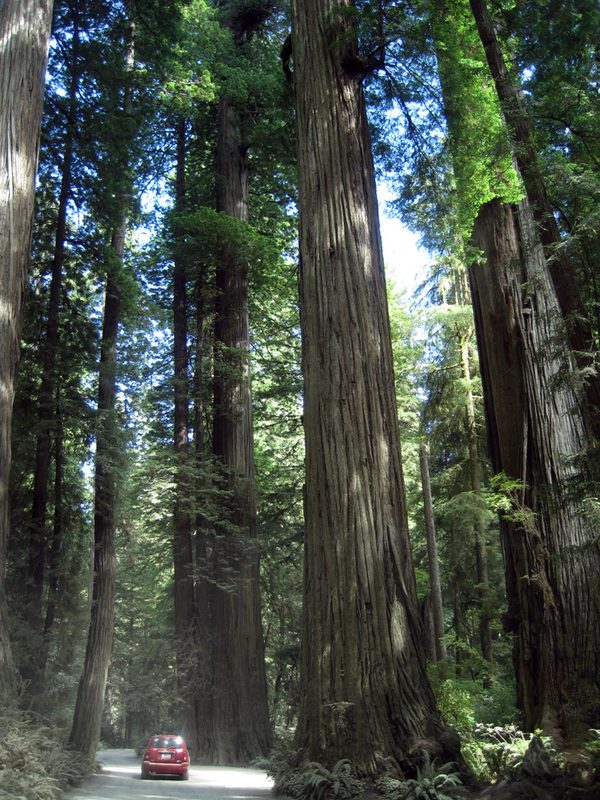 Redwood trees are the world’s tallest trees. 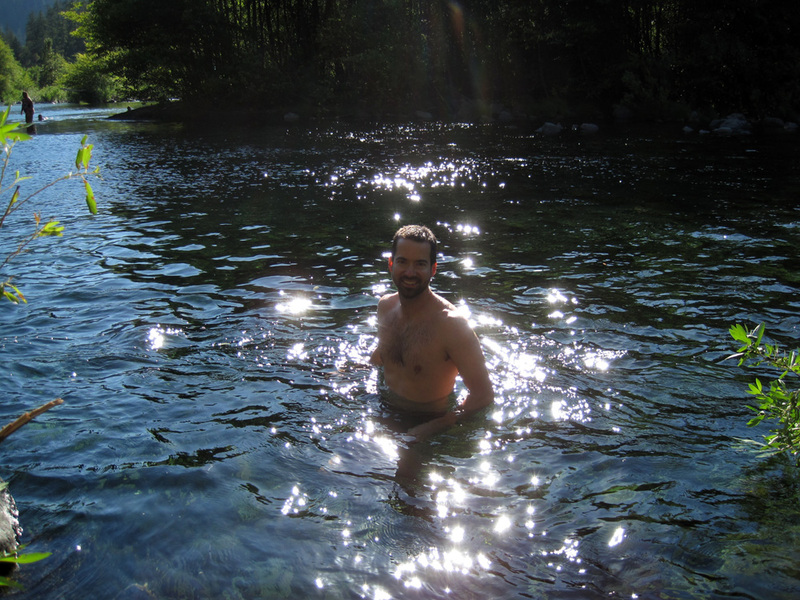 We found a great swimming hole in the Redwood State Park. Shortly after, we crossed the border into Oregon and began passing miles and miles of lush forests, as well as patches of devastatingly logged forests. Biggest producer of lumber in the country, makes sense. 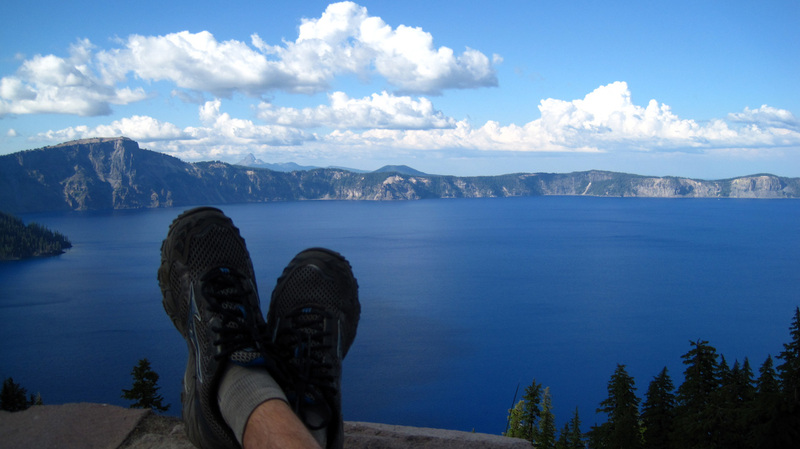 We arrived at Crater Lake on the very last day of our one year National Park Pass membership – it has served us well. We reached the banks of the steep crater, or caldera, and were blown away by its beauty and size. 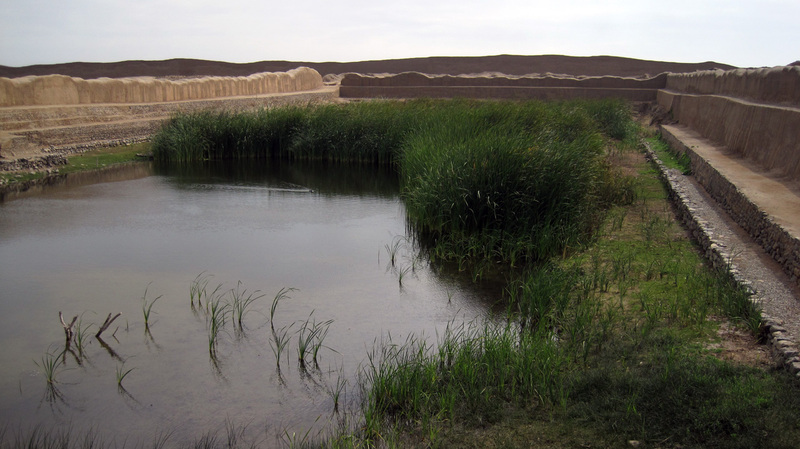 The lake is 6 miles wide and also the deepest lake in North America. Its blue color is so piercing, because, as we learned, of the untainted water coming only from rain and snow. No rivers flow into or out of it. 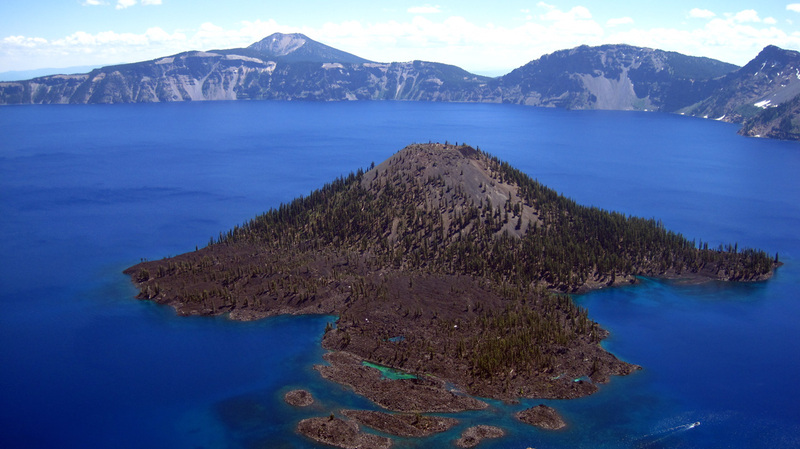 It was amazing to read about the history of this volcano – Mount Mazama, a 12,000-ft mountain, erupted and collapsed onto itself over 7,000 years ago. 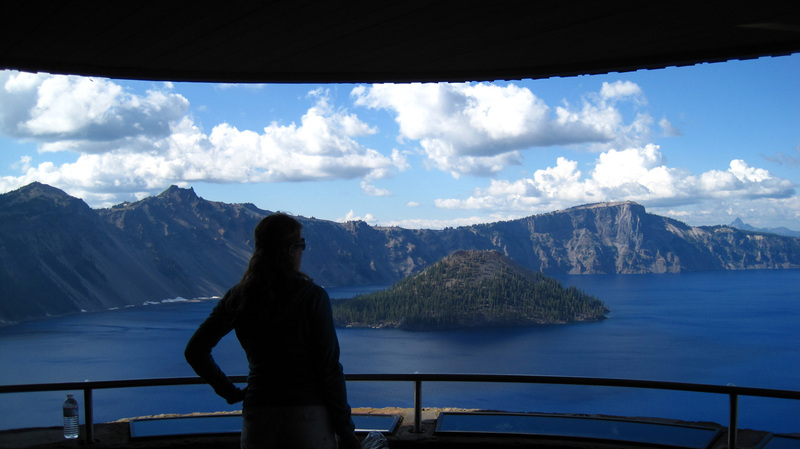 On the steep caldera of Crater Lake. 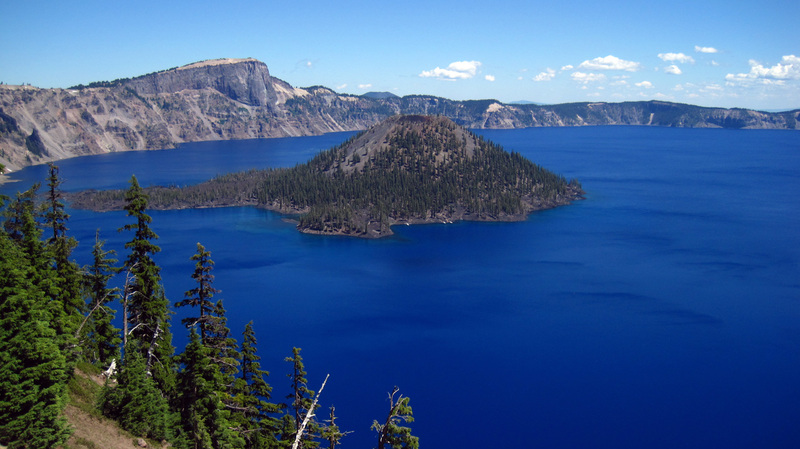 Learning about the colossal volcanic implosion of Mount Mazama that created Crater Lake. Kicking back and enjoying the vista. The electric blue color is due to the its pure and untainted waters. Wizard Island jutting out of the lake. 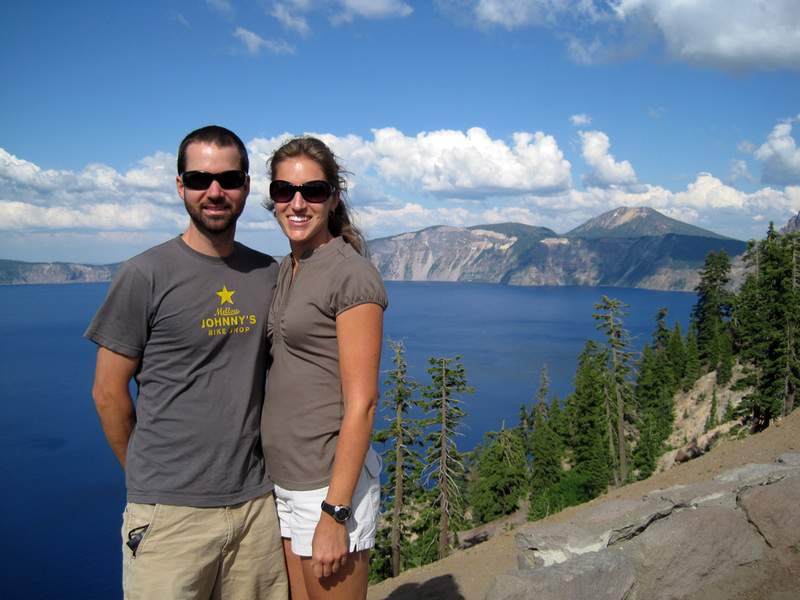 A couple of hours north of Crater Lake, we arrived in Bend, Oregon – a place that had been recommended to us many times on our trip, so we had to check it out. We understood why right away. It’s an outdoor mecca, the next Boulder, Colorado, with endless miles of biking and hiking trails, winter skiing only 30 minutes away, and a plethora of parks. 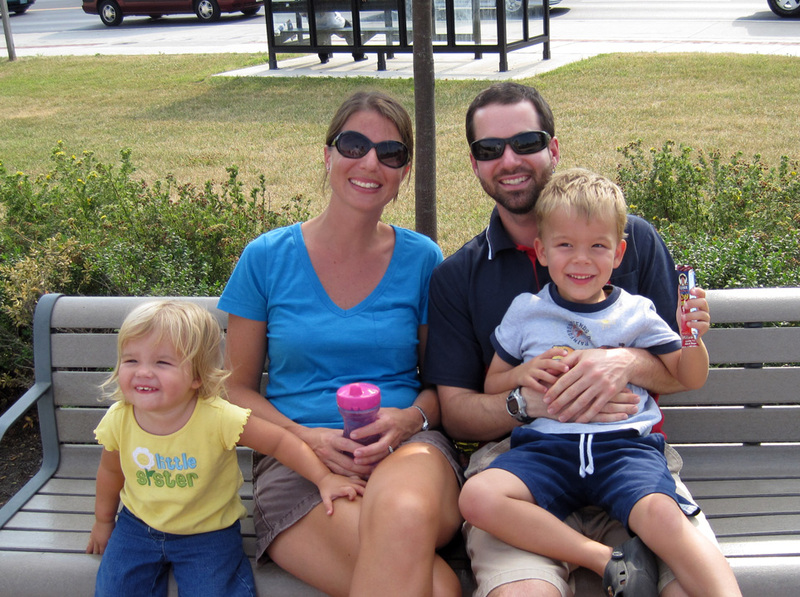 We parked ourselves in a nearby RV park and used the bikes as our primary mode of transportation, checking out the suburbs and parks, downtown area and old mill district. Pat went for a fantastic mountain bike ride on nearby single track trails. 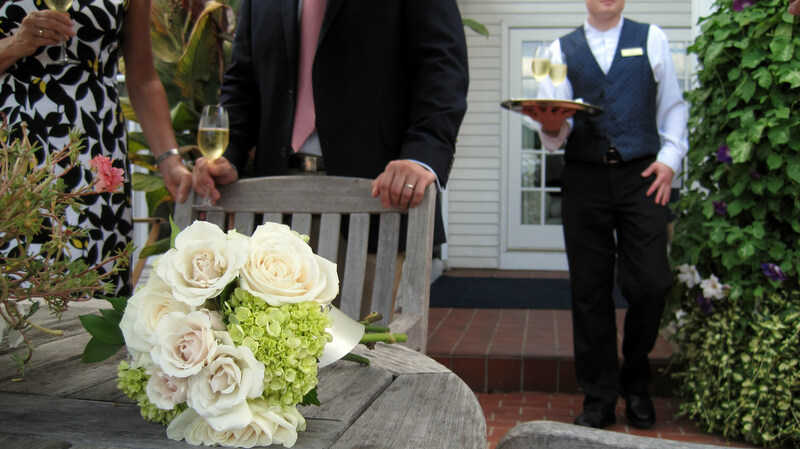 The weather was fabulous – it was a definitely a place we could see ourselves living in – we’ll see! 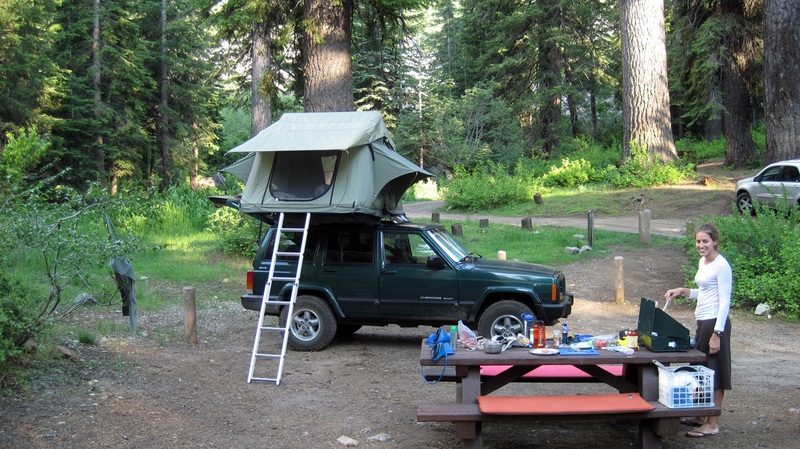 Our camp in Bend, Oregon – dryer sheets in my pocket to keep away the mosquitoes. 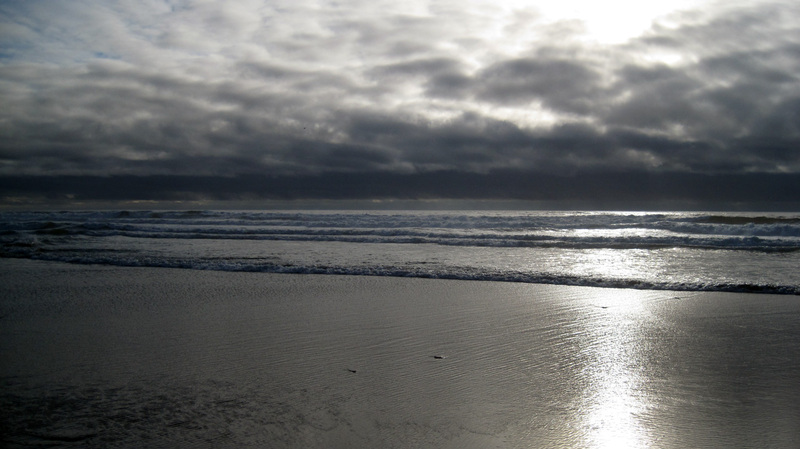 Once again, we made our way back west and onto the 101 to drive up the Oregon coast. We discovered that the locals love playing on the beach and dipping their toes in the water although it is 60 degrees out, without sun, and the water is even more glacial. But sometimes the sun does shine through and illuminates the rock formations and slick sand. 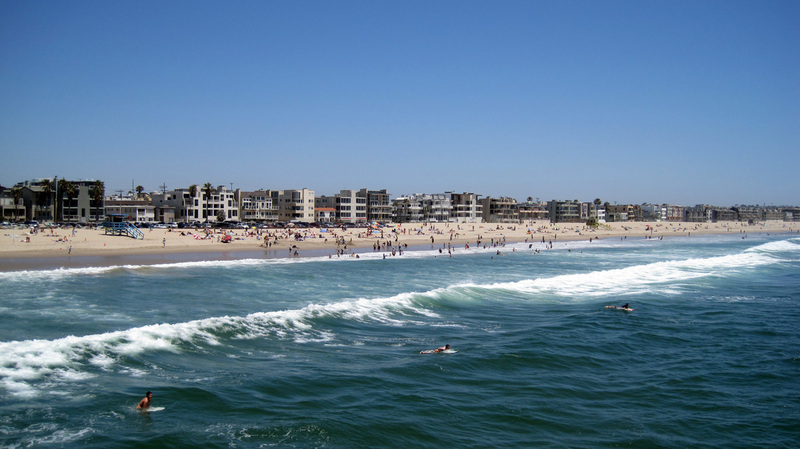 Luckily, there are also a few stretches of beach where vehicles are allowed to drive on. 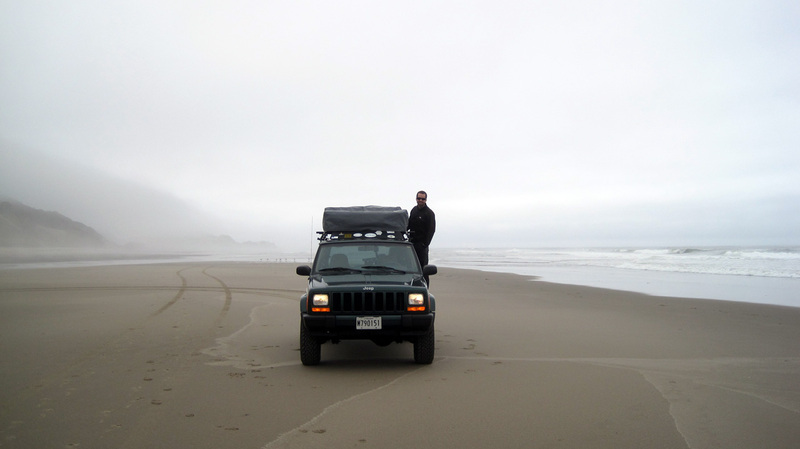 The wet and packed sand makes it relatively safe for Jeep-ing around. Something we don’t get to do on the East coast. Pat was loving it! 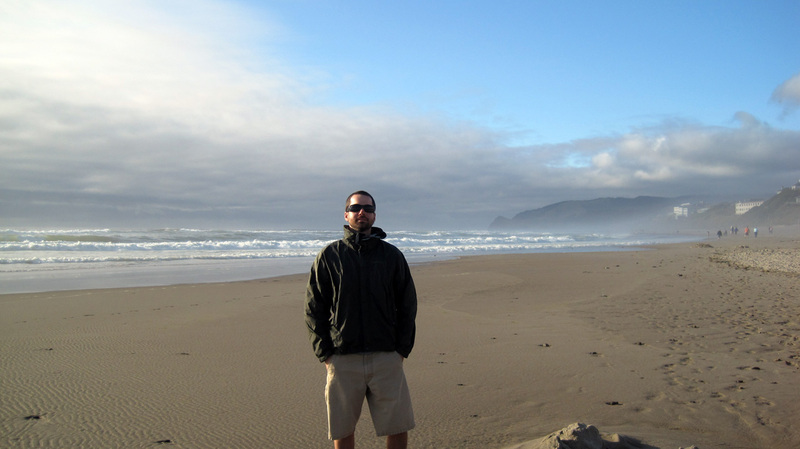 Soaking in the sliver of sun in Manzanita on the Oregon coast. The clouds make for a dramatic sunset. 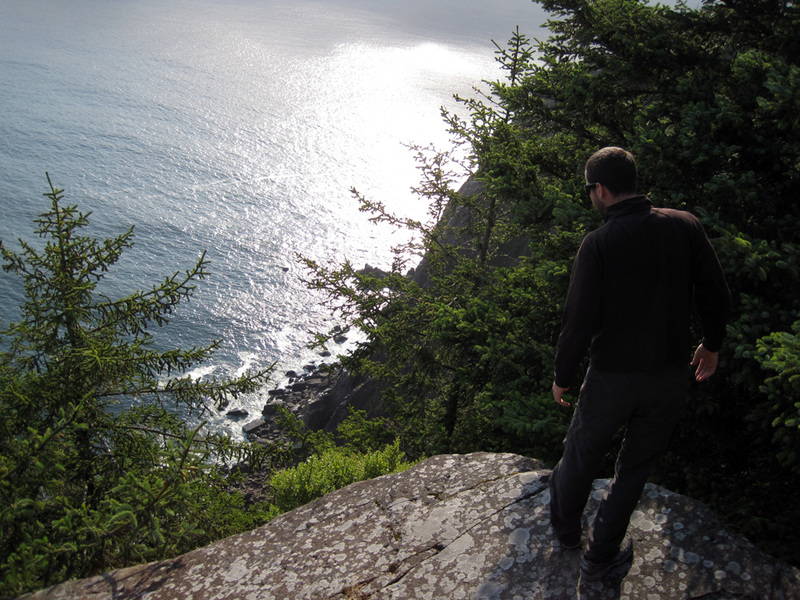 Peering over the steep coastal 101. 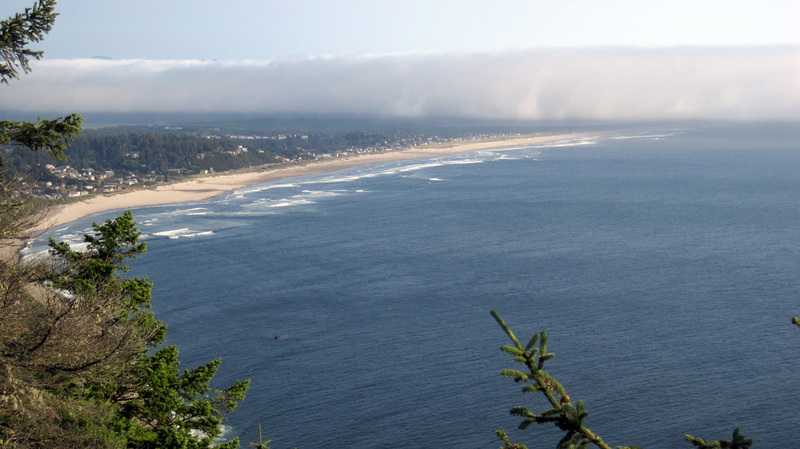 Manzanita beach cleared from the fog. Next stop: exploring the vibrant city of Portland, Oregon. Home! Just off the plane after a looong trip. On the afternoon of June 19th, after about 20 hours of travel and layovers, we were welcomed back to the land of plenty with open arms. 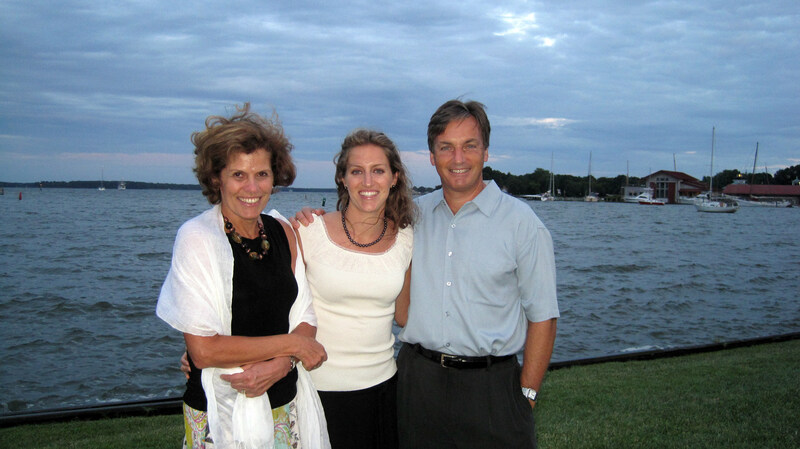 Our parents met us at Reagan/National and took us home to Frederick in their modern cars, on smooth wide roads – with signage in English – that are patrolled by police who don’t take bribes and actually enforce laws. In short, it was amazing! The US Customs official that checked us through jokingly asked if there were any countries we hadn’t visited. We assured him that there were a few. Indeed, we’ll have to go back for Brazil someday, there’s going to be a wild party there in about 4 years… maybe check out World Cup 2014? Our folks were very happy to have us back here in one piece. I’m sure they worried a bit too much while we were gone, but I must admit, I was greatly relieved to be back too. 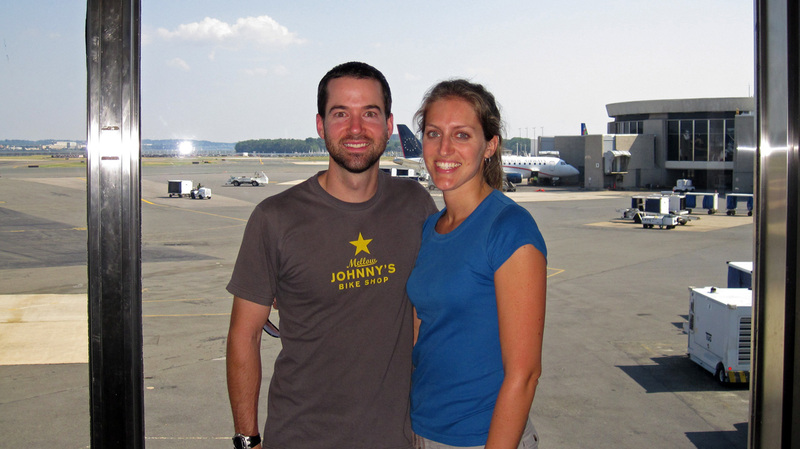 The ‘Latin American’ part of our journey was about 7.5 months in total, hace mucho tiempo! Since returning we’ve had a busy couple weeks visiting with many of our friends and family who we missed dearly. It’s hard to say we’ve been ‘travelling’ because it’s so easy to get around here! But we still are. There was a short trip up to Pittsburgh, Philly, and New York that was tons of fun, but a bit too brief. A few quick trips down to DC were great, such a beautiful & diverse city. 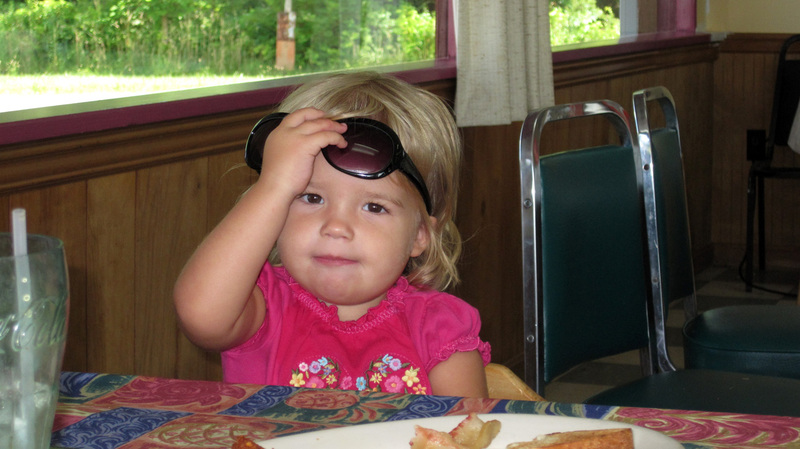 Of course, our nieces and nephews have grown so much since we were gone, and everyone is doing so well. It was great to catch up on all the things we missed. In the end, we are both just very lucky to have loving families and friends. Thank you all for the quality time together, that’s exactly what we’ve missed and were looking forward to. 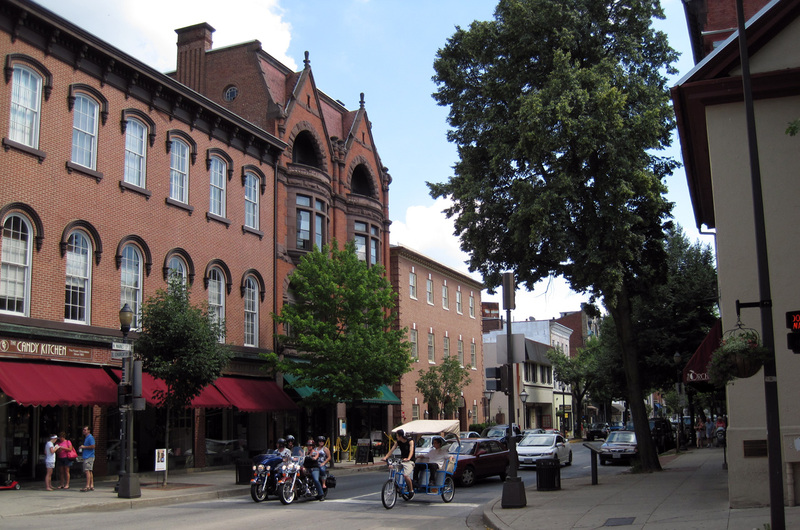 Bicycle rickshaws in downtown Frederick? One of many delicious meals with the Han's and Gouin's. Dan moves so fast he's hard to photograph! 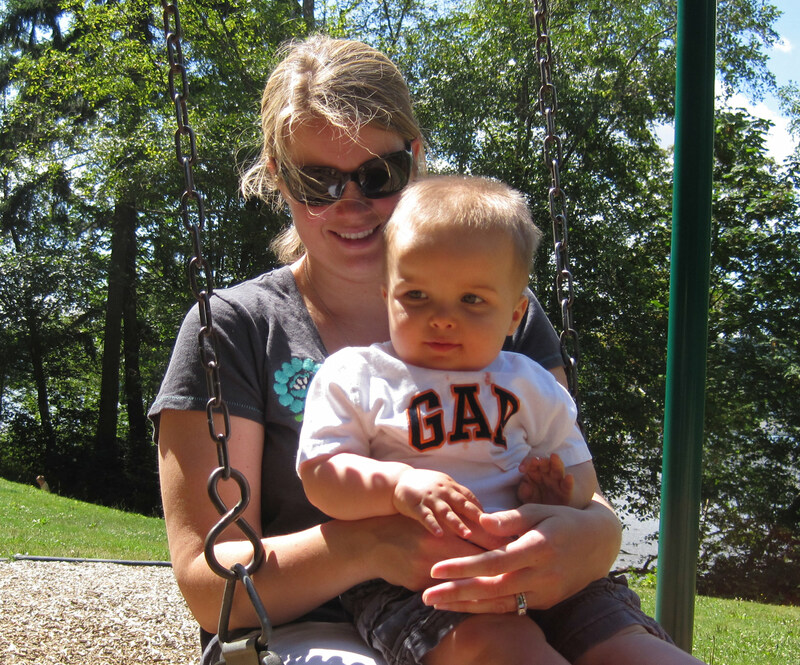 Aunt Caro makes up for lost time with Alexandre. 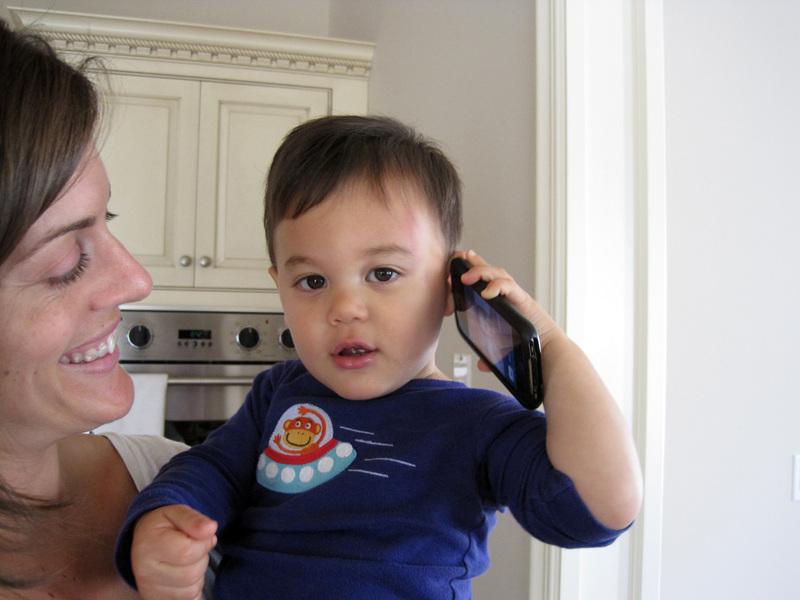 Alexandre is an iPhone fan already. Uncle Pat met Luke, Grace and Andrea at the train station. 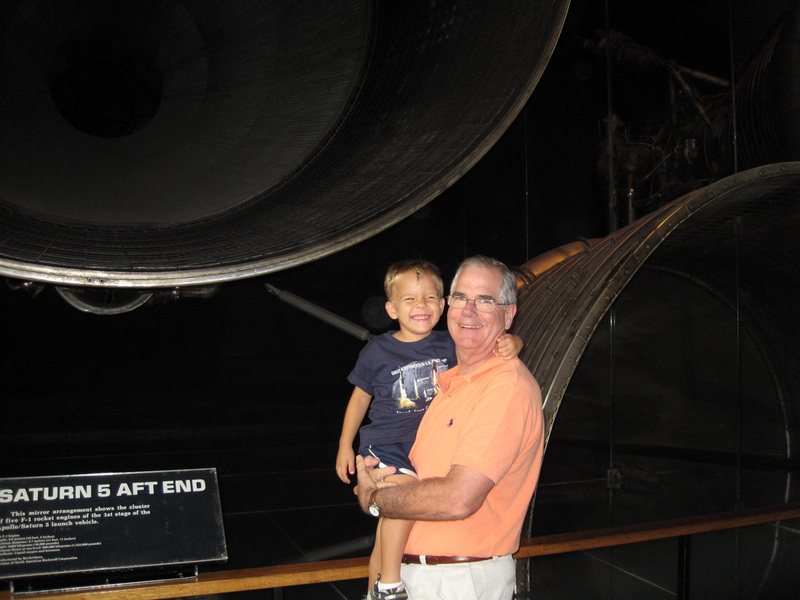 Grandpa and Pat took Luke down to the Air & Space museum, he wore us out. We eventually wore him out too. The Digdo's came up to Frederick for a visit. 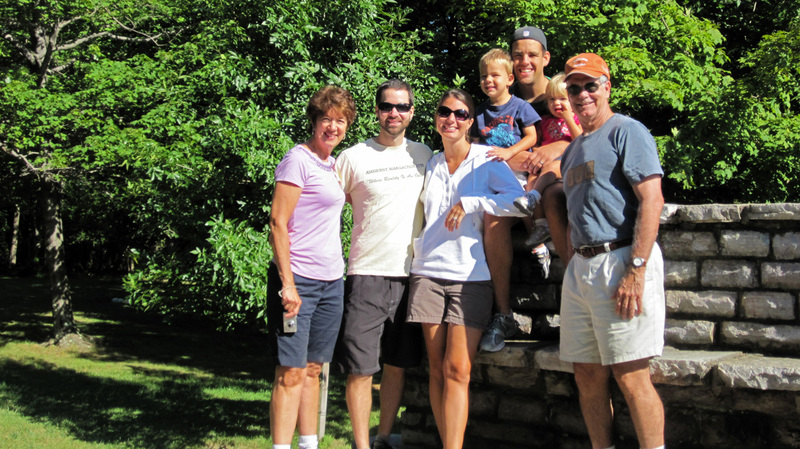 Morning hike in Gambrill with the Moloney's. Grace got so big while we were gone, she's a chatty little girl now. Two weeks of visiting home and celebrating the 4th of July had us refueled and ready for the road once again. We took an early morning hop on Delta over to Phoenix, Arizona to meet up with our long lost friend, the Jeep! John and Julia (my Uncle & Aunt) have been taking care of the old “treehouse on wheels” since we’ve been gone and they did a wonderful job! The green machine fired right up and was as if we never left it. We put the tent on top with some help from their neighbor Trevor and were on our way in a few days. Thanks again J&J!! 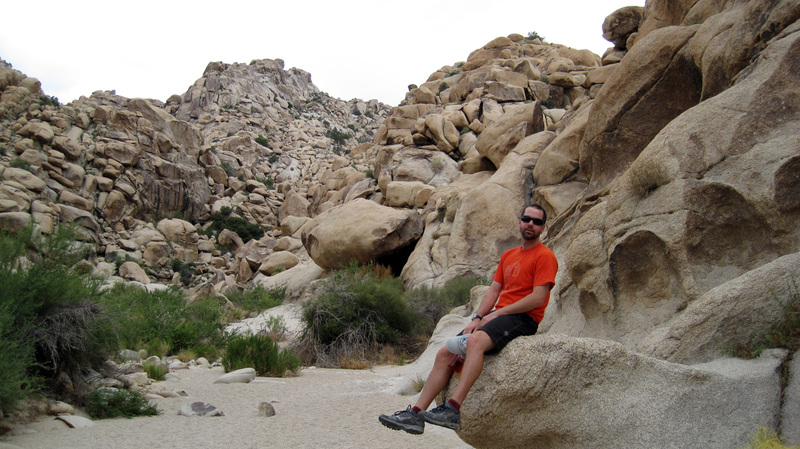 Our first stop on our road trip (round two) was Joshua Tree National Park in the Southern desert of California. There’s a good reason why most people visit this part of the state outside of the summer, it’s HOT. We baked at night in the tent but actually really enjoyed the place. It wasn’t crowded and there’s lots of excellent trails and diverse landscapes to explore. 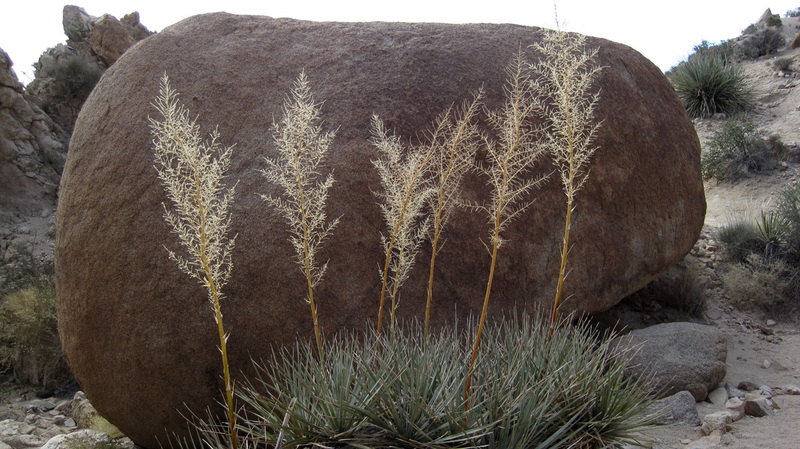 Also, both of us have become secret desert flora & fauna enthusiasts after spending so much time in the Southwest last year. We love and can identify so much out here. 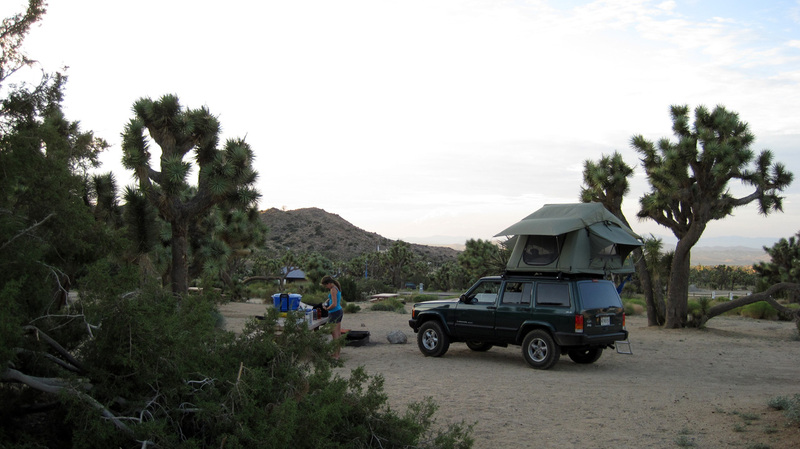 Our first night back in the tent at Joshua Tree National Park, California. 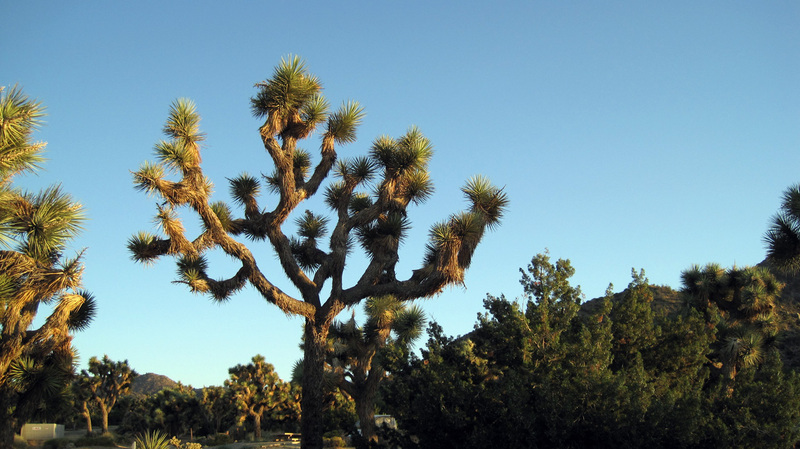 Yucca stalks silhouetted against a giant boulder in Joshua Tree NP. 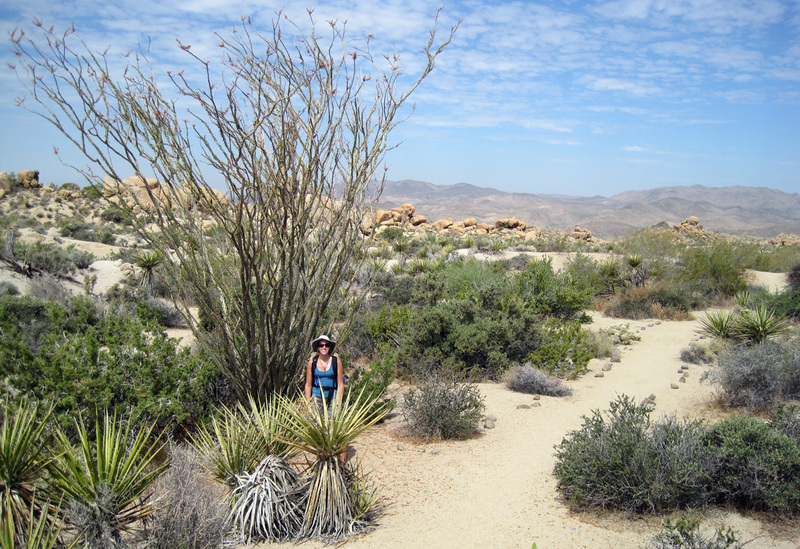 Caro's favorite, a giant Ocotillo! We took off on a 8 mile hike early the first morning before it got too hot. 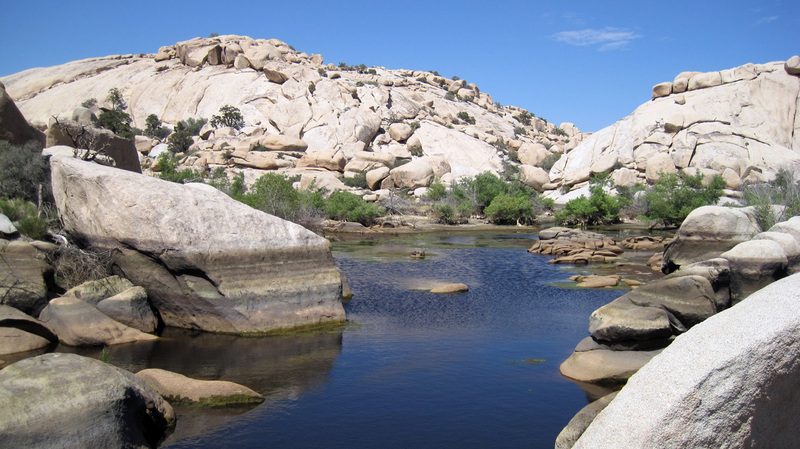 Little Barker Dam creates a welcome oasis in the middle of the park, it was over 100F this day. 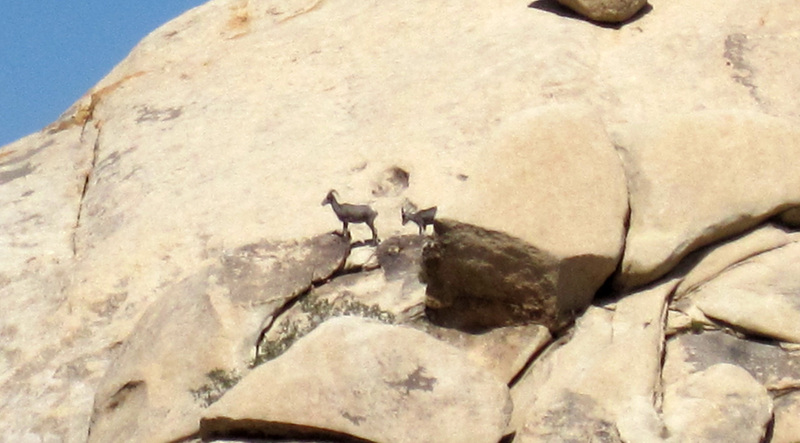 Big horn sheep on the rocks above Barker Dam, these are a very rare sight as a Ranger explained. Playing on the rocks in the Indian Cove section of the park. 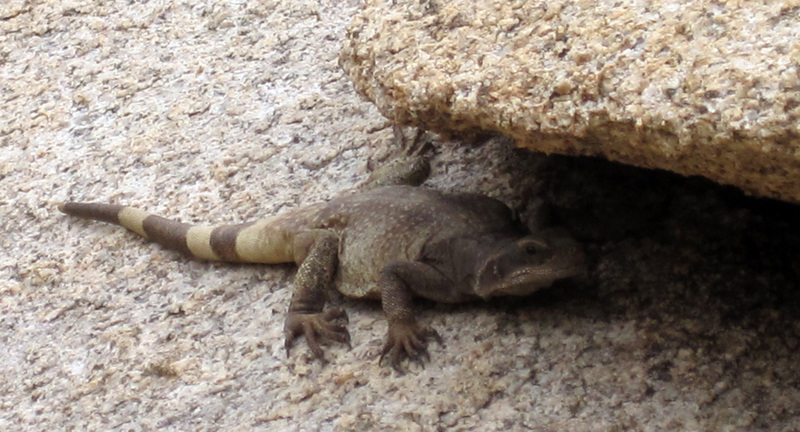 An unidentified but big lizard seen in Indian Cove. Relaxing lakeside at Big Bear, CA. 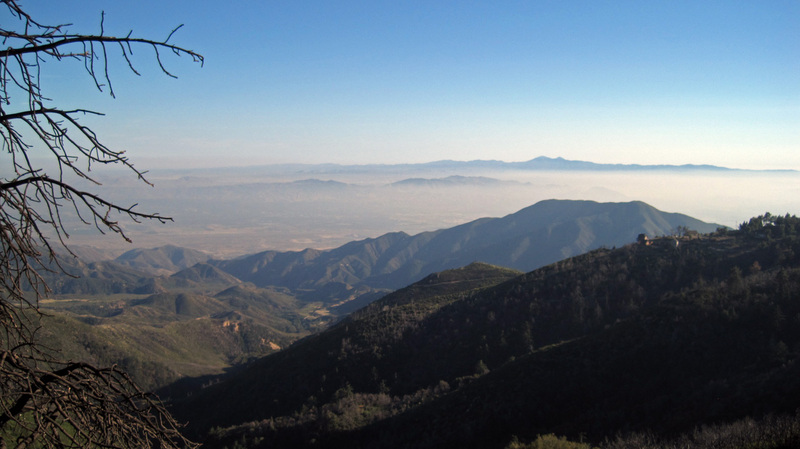 Driving down to LA from Big Bear Lake, there's a cloudy/smog layer covering the valley below. 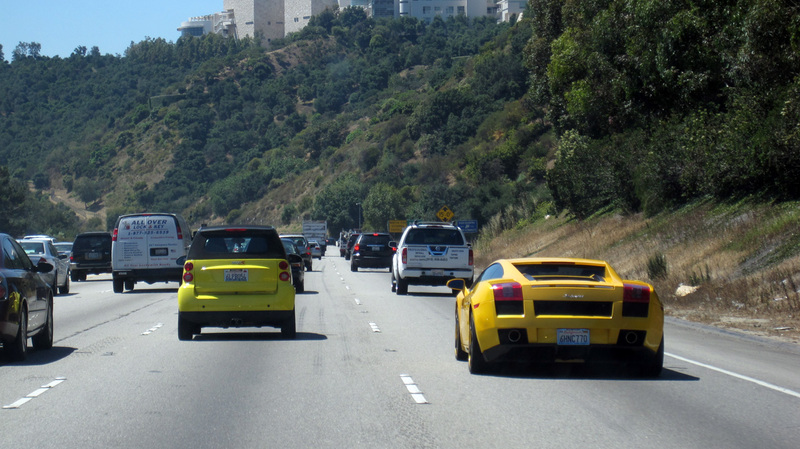 Only in California: a Smart car passes a Lamborghini Gallardo. 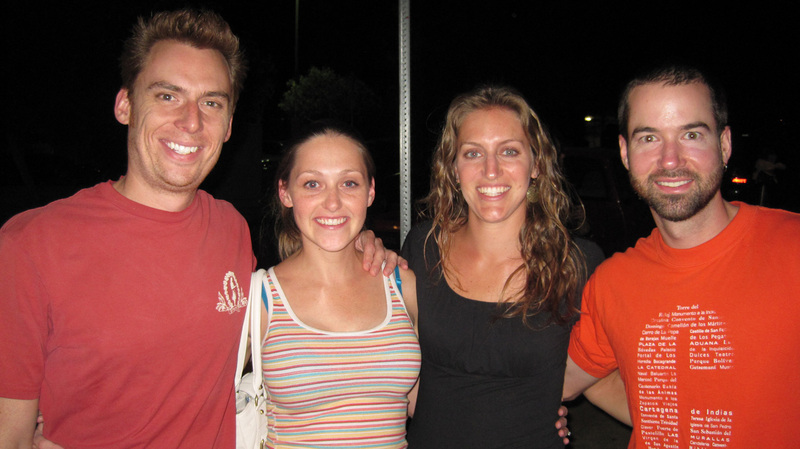 We were heading to LA to hangout with our good friends Brent & Mandy, you might remember them from the glorious Green River canoe trip last year. 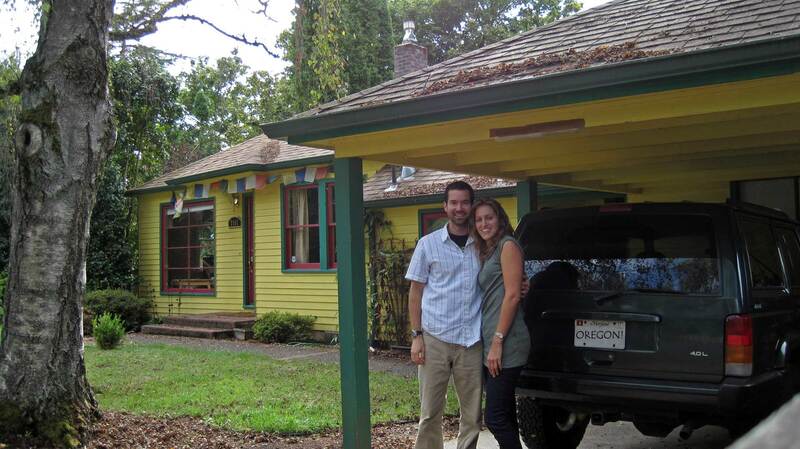 After college they moved out to the LA area and recently bought a beautiful home in Burbank. It’s been awesome to just relax indoors, yeah – we’re definitely getting soft, but the past few days in the desert had us dreaming of AirCon. While they are both away at work during the day, Caro and I have been checking out Los Angles. LA is so much bigger than I remember it, and so cool, it has been a challenge trying to pack it all into a few days. The Bikes are back too! 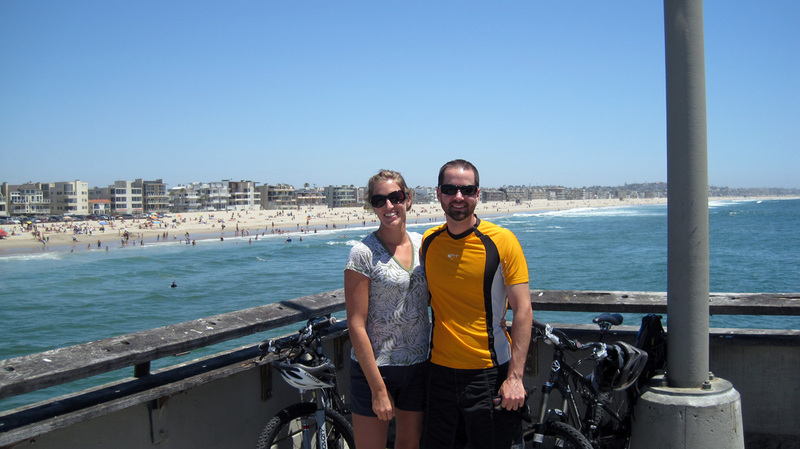 We had a great ride down the beach front path through Santa Monica, Venice Beach, and Marina del Ray. Back on the Pacific, just like Peru. Out to dinner with Brent & Mandy at Ginger Grass. 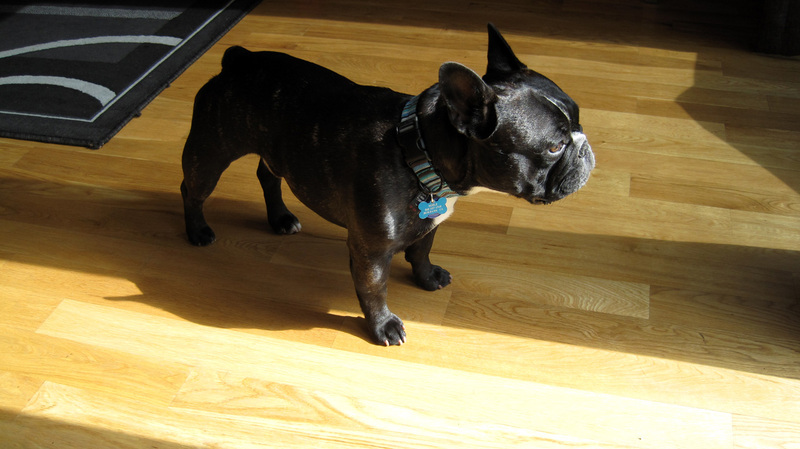 Noble, one of their French Bulldogs. We’ve updated the Viaje al Sur Google Map of the whole trip, check it out! The sweeping views from the Way Inn Lodge. Having visited and trekked to arguably the biggest landmark in South America – Machu Picchu – it was easy to feel that our trip down here was nearly complete, with only a few weeks remaining in Peru before we head back home. As it turns out, Peru has been an ideal country to save for last with its beautiful landscape, rich pre-Colombian history, friendly people and wonderful food. 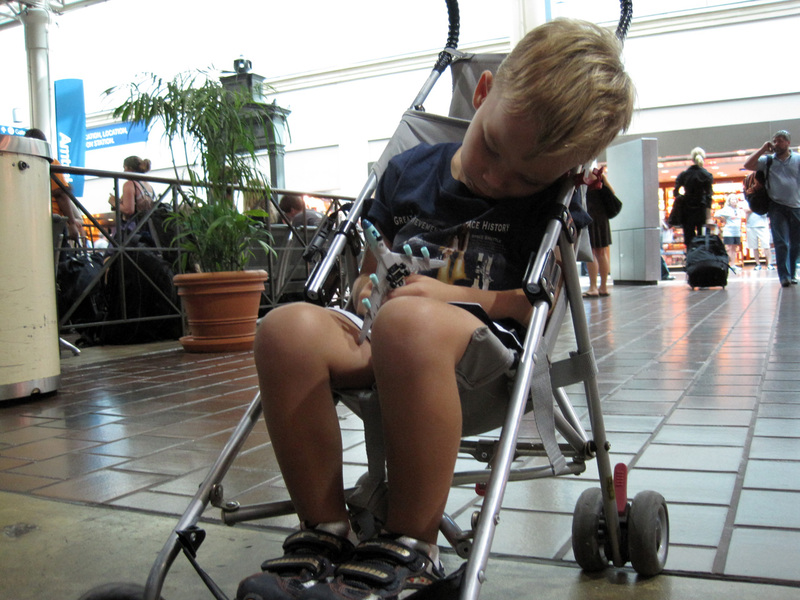 As expected, we were a bit tired after our mammoth trek and were looking forward to relaxing. 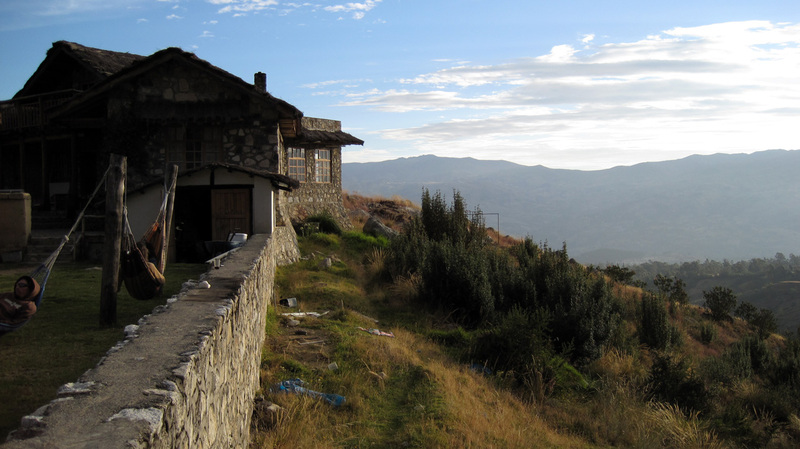 We had one criterion in mind: finding a place like the Secret Garden hostel from Ecuador in Peru. 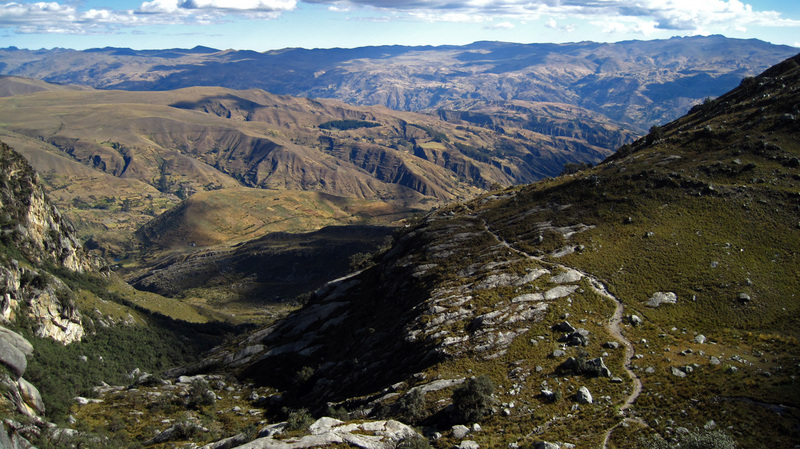 Thanks to the Peru Lonely Planet guidebook (and thank you to Andrew and Vicki for leaving it with us), we got lucky. After a few long bus rides (28 hours in total) we made it to Huaraz, a small city in the middle of the Cordillera Blanca. 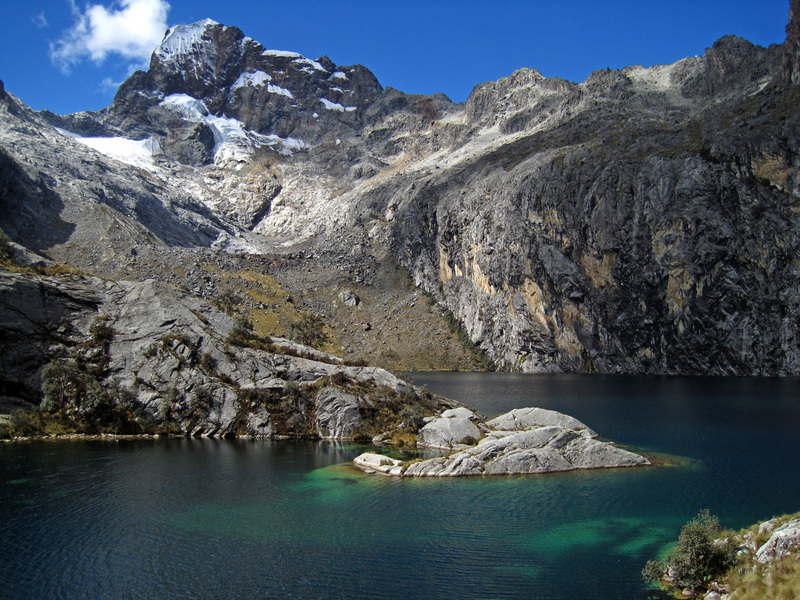 Huaraz is a mountaineering hub and attracts lots of trekkers and climbers from all around the world. We were grateful for that as we spent a couple afternoons in the super gringofied Café Andino reading English-language magazines, listening to David Gray as background music, and eating breakfast at any hour. 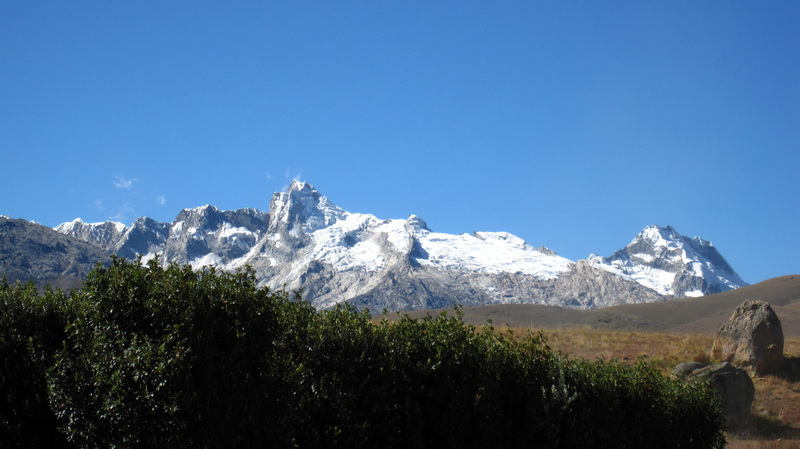 Part of the Cordillera Blanca mountain range. Finally we pulled ourselves away and about a 40-minute drive outside of town, we discovered The Way Inn: a beautiful eco-lodge perched up in the mountains with a breathtaking view of the surrounding snow-capped peaks (actually, 3 of the employees had also spent time working at the Secret Garden hostel in Ecuador). 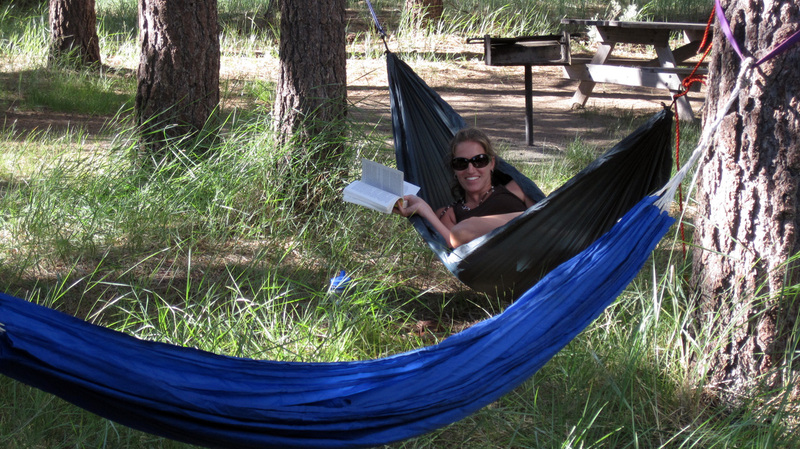 We settled into our bungalow, and passed the time reading in the hammocks, simmering in the hot sauna, gingerly trekking around the property, and eating their gourmet food. It was fabulous, though I have to admit I came down with infectious something or another, probably from some bad bus food. Unfortunately the elevation doesn’t really help boost your immune system either. 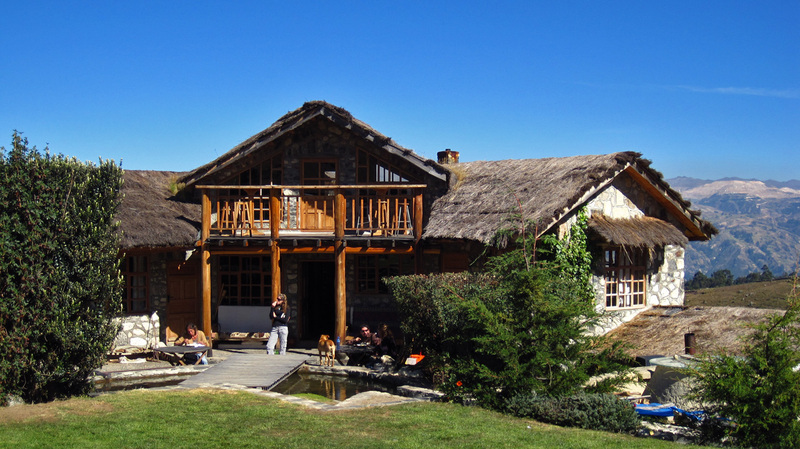 The Way Inn mountain lodge in the Cordillera Blanca. Our rustic paradise for the next 4 nights. 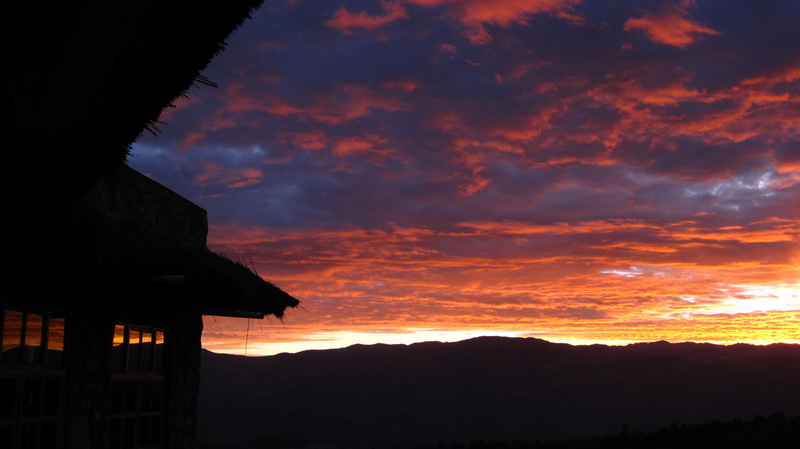 Colorful sunset skies of Huaraz. Finishing up work in the afternoon sprinkle. 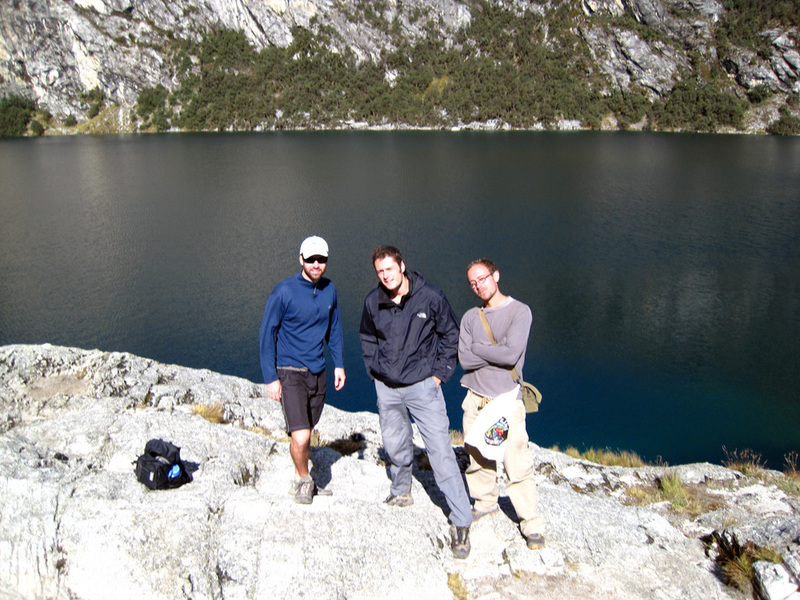 Although I had to stay close by, Pat was able to get away for a 5-hour trek with some newfound friends Matt and Rory, expats from the UK and Botswana living in Lima. I sadly regret not feeling well, because from the pictures it looks like a beautiful trek up to the pristine Laguna Churup. The crystal clear water turned out to be a blessing for the guys, since both Matt and Rory had forgotten their water and had to share Pat’s 1-liter Nalgene the whole climb up. Too much wine and ‘Locale’ (board game about exotic destinations) from the night before. 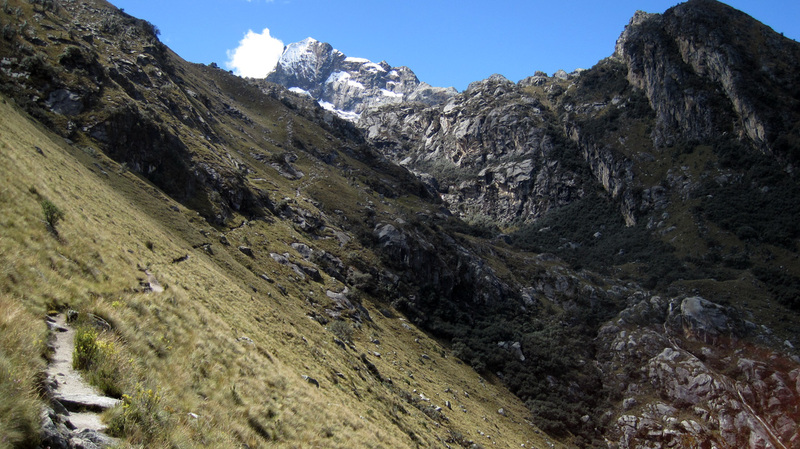 The trail creeps along on the hike up to Laguna Churup. Crystal clear water of Laguna Churup, drinkable too. Rocky outcrops on the banks of the lagoon. Matt and Rory made it up despite intense hangovers. Descending the trail in late afternoon light. 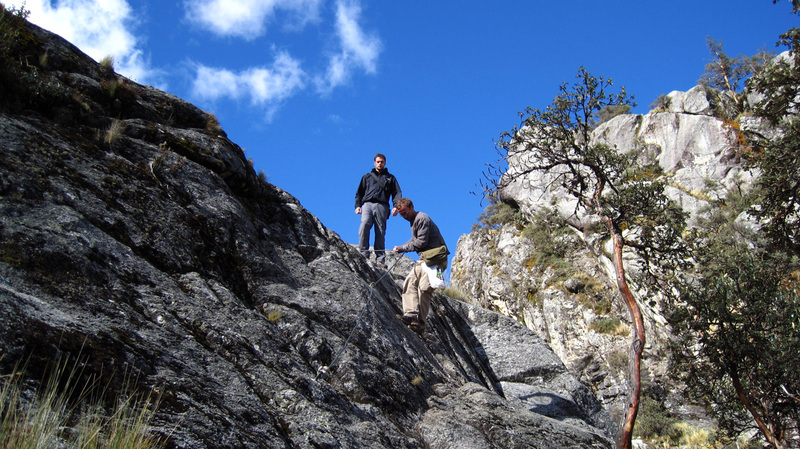 Matt and Rory take turns coming down the rocky cliffside. 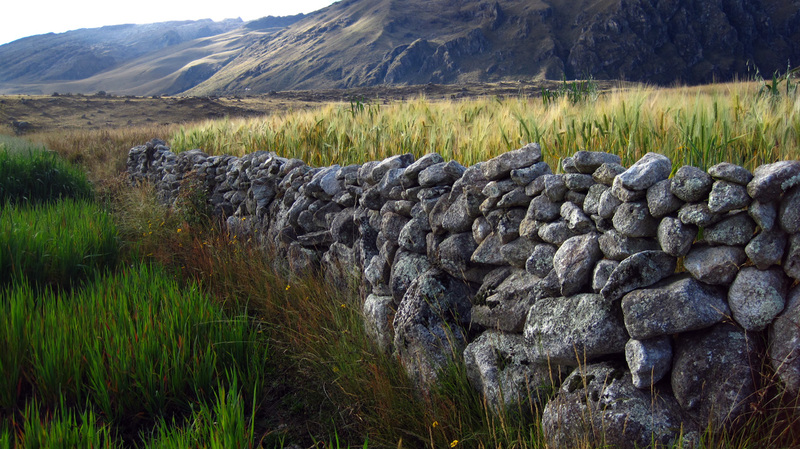 Old stone walls surround small fields along the way. 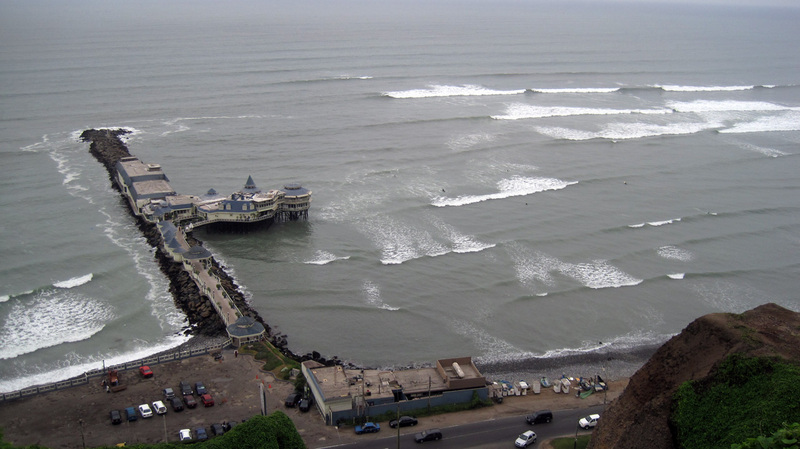 After we were fully rested (and I was feeling better), we headed back down and the next day boarded yet another bus – this time up the north coast to Huanchaco, a small fishing town right outside of Trujillo that also poses as a surfing hotspot. Usually the northern coast of Peru is perpetually cloudy during the winter, but the sun came out for us on a few days as Pat did some surfing and I took in some rays. We successfully managed to eat too much ceviche and were often the only customers at each restaurant. 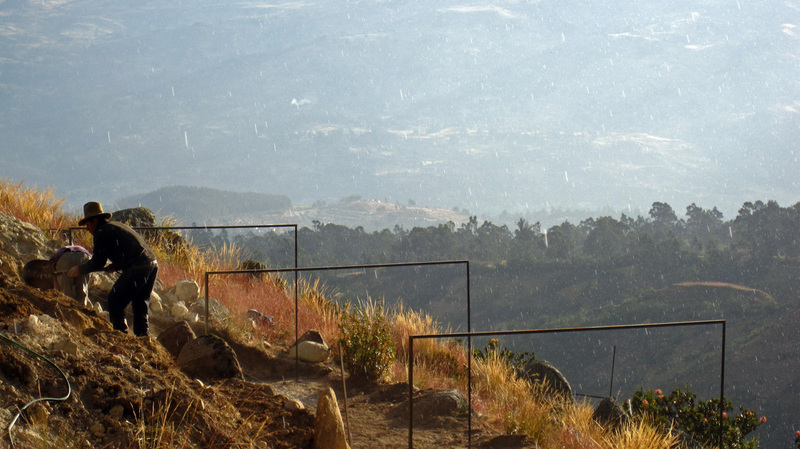 The luxuriously brown hot springs of Monterey, outside of Huaraz – we opted for a private bath. 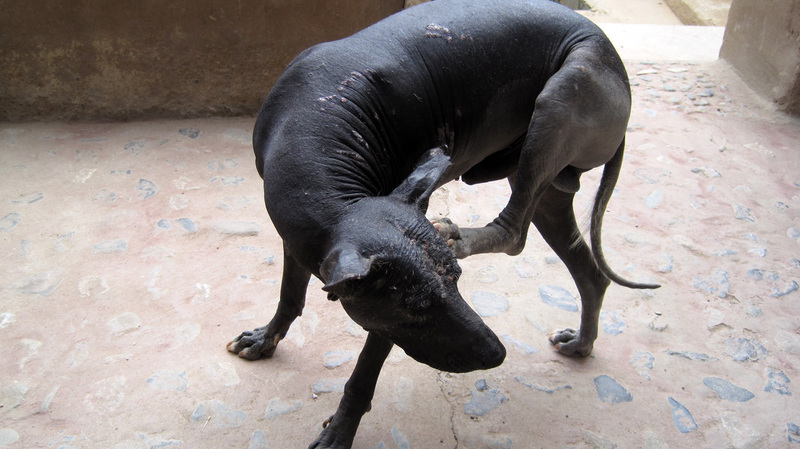 Meet the Peruvian dog – black and hairless. Pat braving cold water and trying to catch some waves. 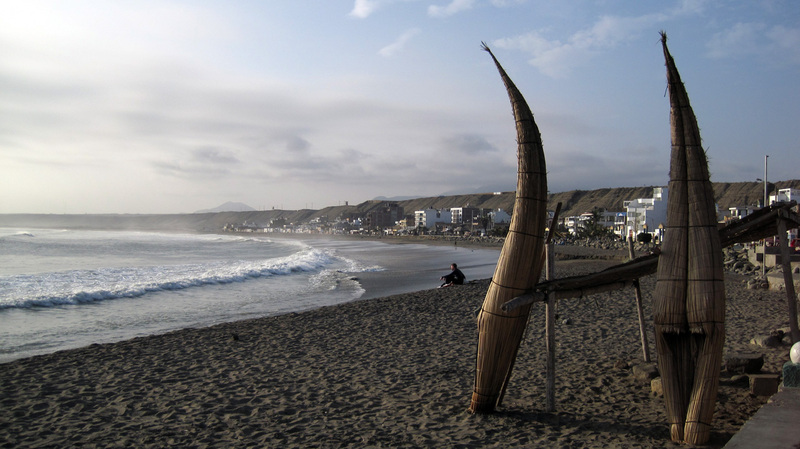 The famed Caballitos de Tortora – ‘little horses’ fishing reed boats – in Huanchaco. 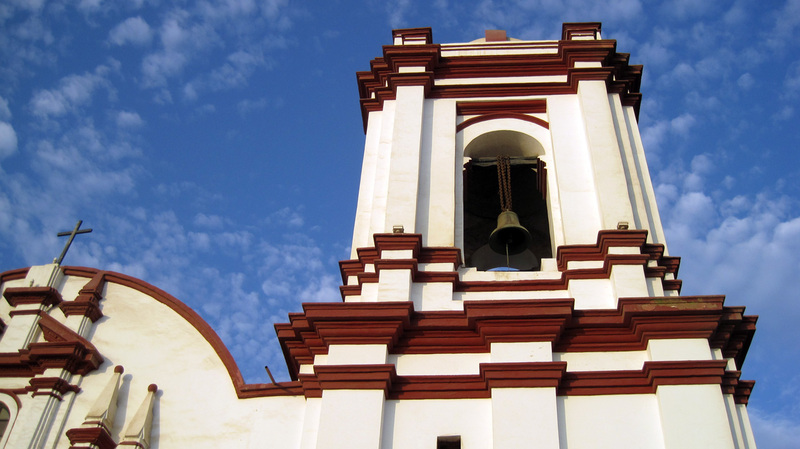 Sanctuario de la Virgen del Socorro – second oldest church in Peru. The Caballitos lined up against the boardwalk. 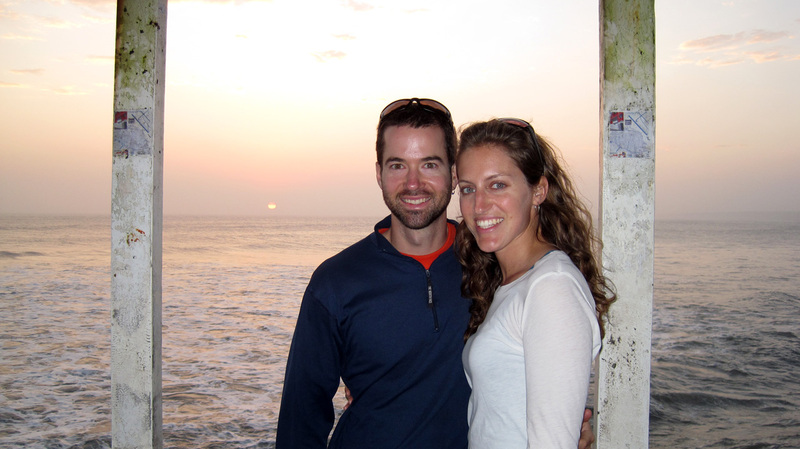 One of our last sunsets in South America. 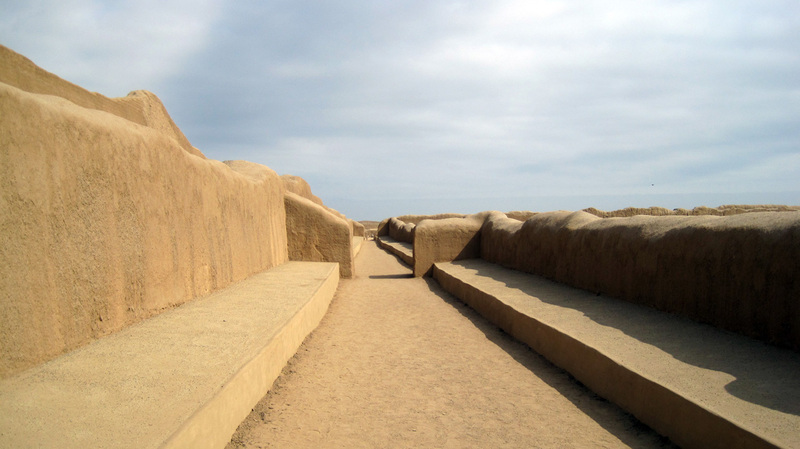 On a cloudy day (and in between World Cup matches), we visited the nearby archeological site Chan Chan – the largest adobe city in the world. 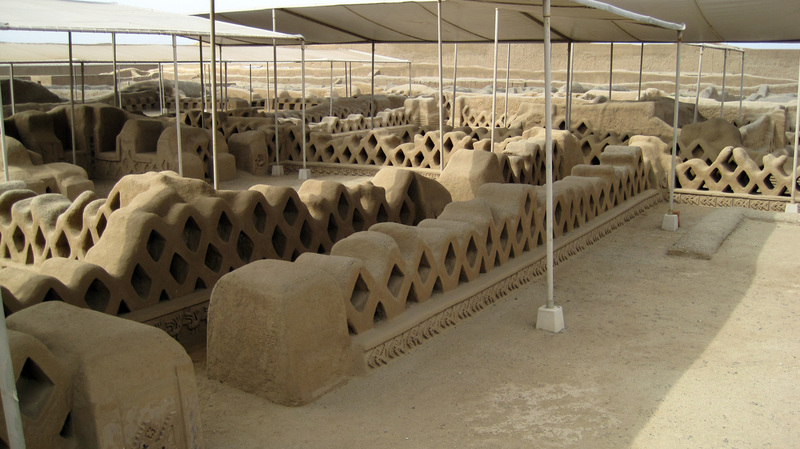 It was built by the Chimu tribe (pre-Inca) known for their adobe friezes displaying geometric designs of aquatic life. We visited only one palace –only one out of 9 is excavated – where the royal family and aristocracy lived. 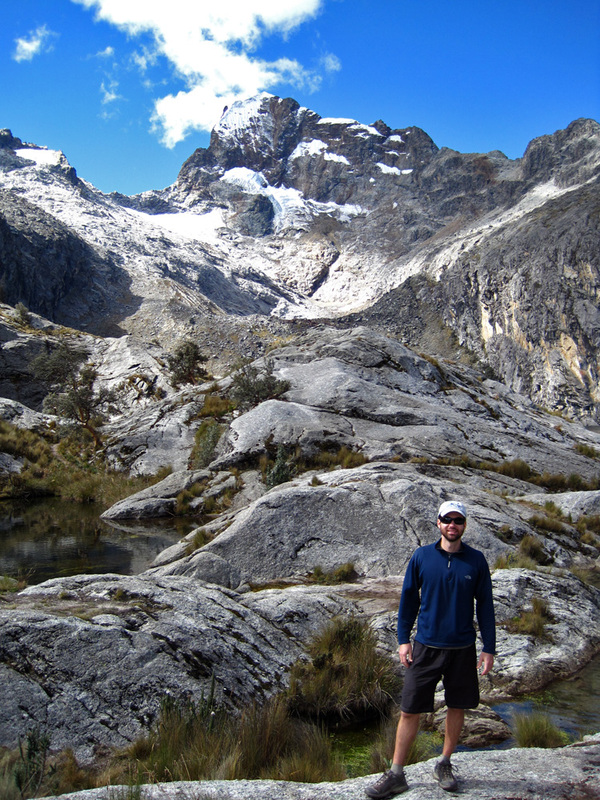 The vastness and intricacies were really impressive, and we hired a wonderful guide named Gustave to show us around. 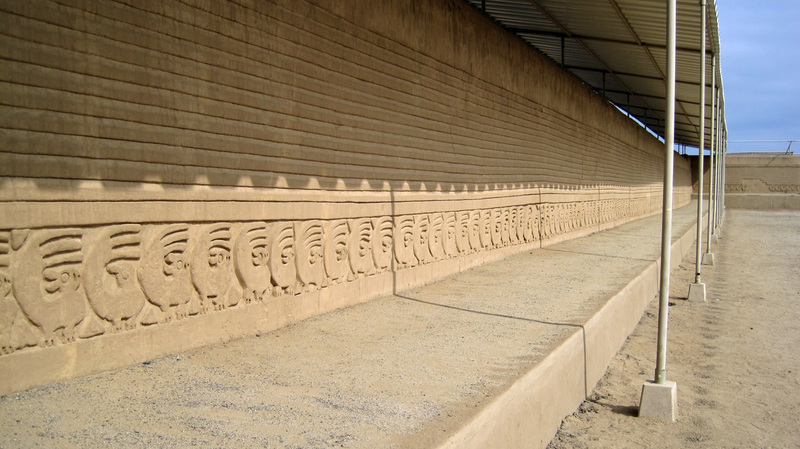 The ornamental walls of Chan Chan – biggest adobe city in the world. 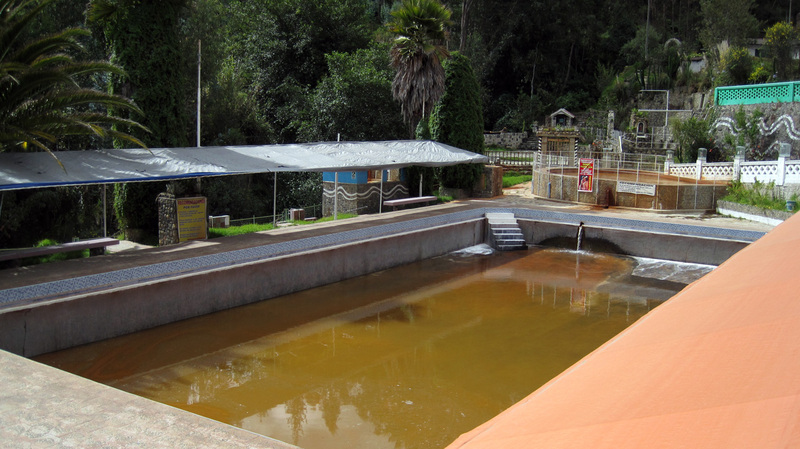 The fresh water spring of the Tschudi Complex - still there after 500 years. "Main Street" - the longest corridor in the palace. The elaborate friezes of the Ceremonial Courtyard – representing the waves of the ocean and the iconic squirrel. 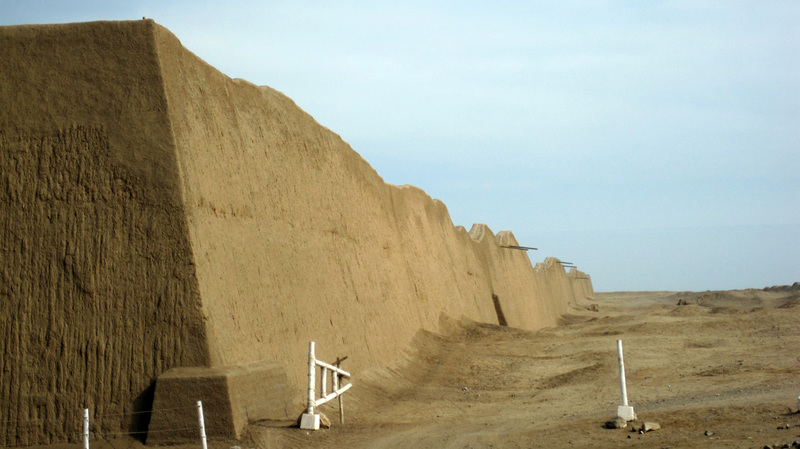 The outer walls of the Chan Chan palace – they used to reach 12 meters (40 feet). 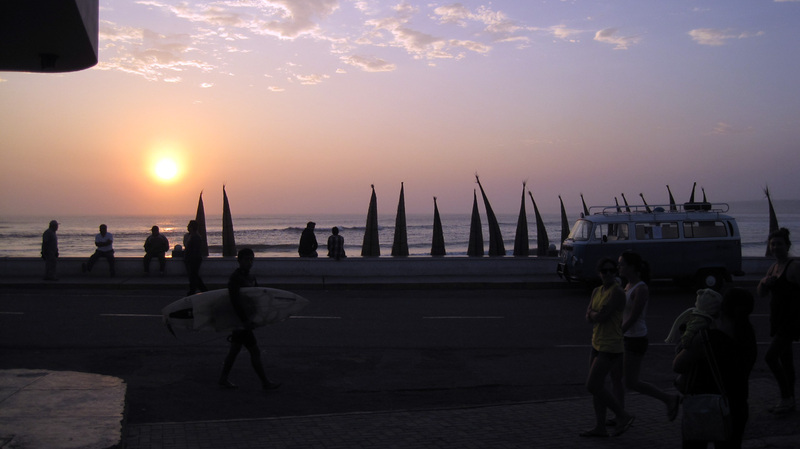 Since then, we’ve made our way back to Lima, and I am happy to say boarded our very last bus in South America! I counted, we took our 45th bus ride. 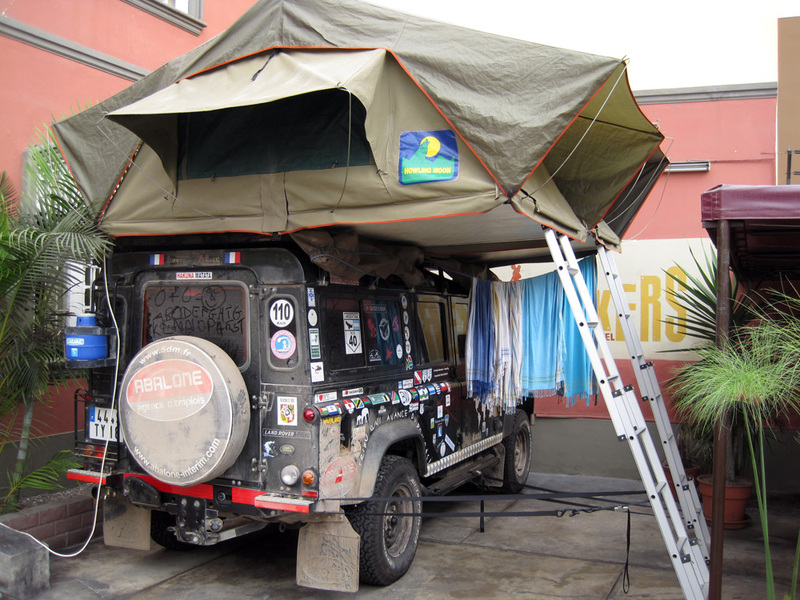 And as we reflected on this, we booked a room in the same hostel as a French family of 5 (3 children of 12, 10 and 7) with their Land Rover and 2 roof top tents driving across South America and having already driven across Africa and the the Middle East. With our Jeep safely parked in Arizona, we felt like wimps. 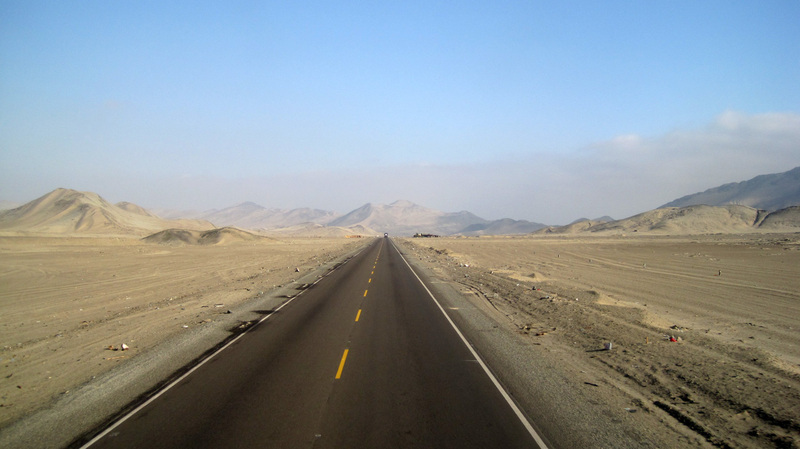 Out 45th and last bus ride in South America – the major thoroughfare in Peru: Panamerican highway. Reminding us of our beloved Jeep. We’ve spent the remainder of our time in Lima walking around the city in Miraflores, doing a little souvenir shopping, watching the World Cup and hanging out with some new friends. These last 2 weeks have been a perfect culmination to our journey down south as we’ve taken some time to reflect on our last 7 ½ months in Latin America and soak in what’s left of it before we hop on a flight (tonight!) northbound for DC! 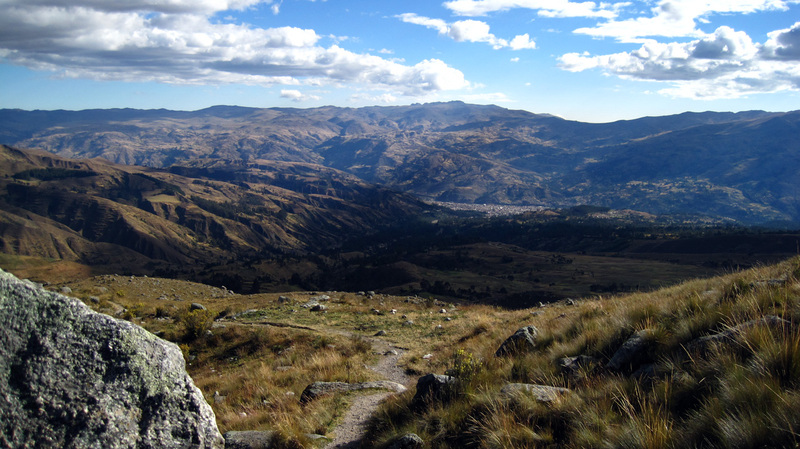 Goodbye South America – we’ve had a wonderful time down here! We can’t wait to see everyone soon and look forward to the next leg of the journey! On the edge of the cliffs of Miraflores, Lima.